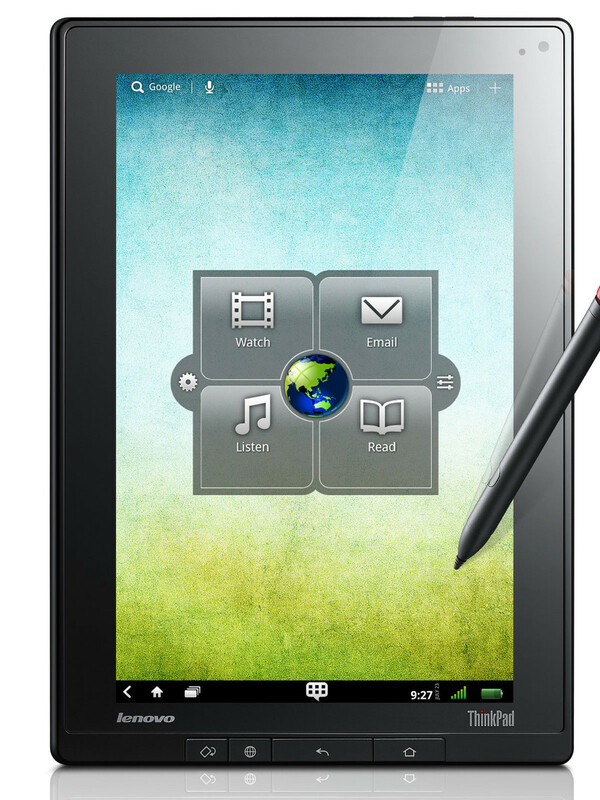 When you think of tablets, you probably first think of the Apple iPad 2, the Motorola Xoom or the Asus Transformer. 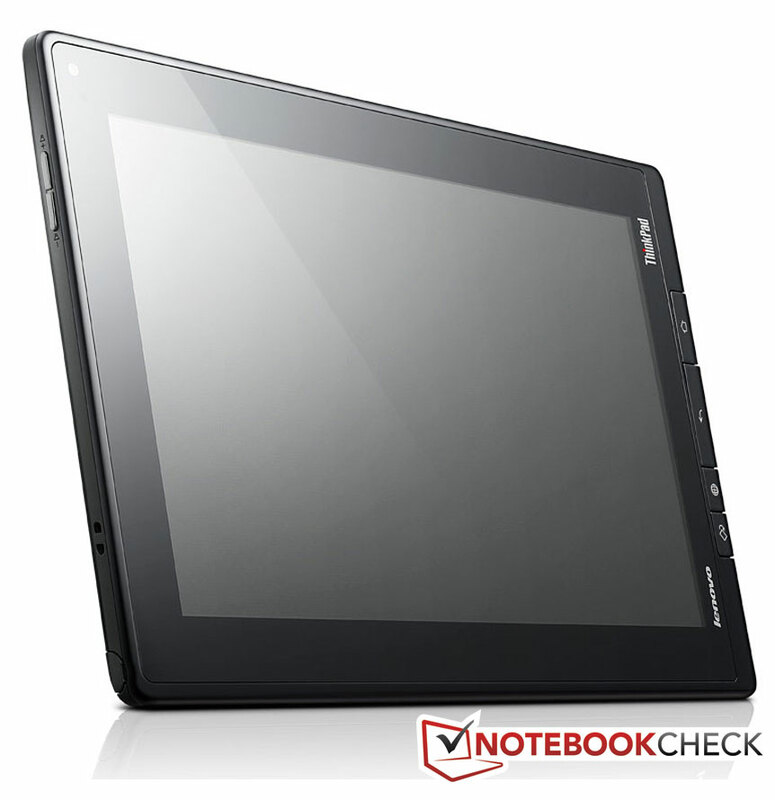 But from now on, you should remember this name too: the Lenovo ThinkPad tablet (model 18382 DG). Why? It’s quite simple: everything those tablets can do, the Lenovo tablet can also do - and more. 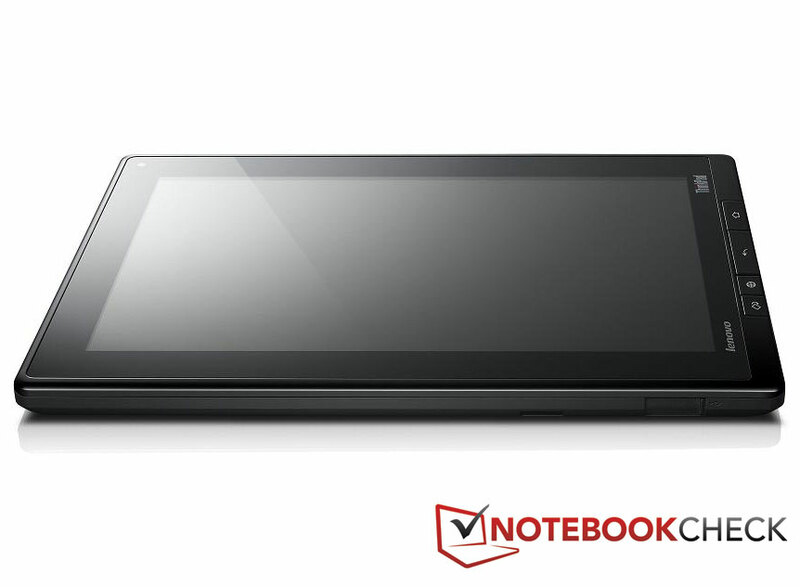 The ThinkPad tablet is based on the Nvidia Tegra 2, which works with a speed of 1 GHz and has 1 MB of RAM. 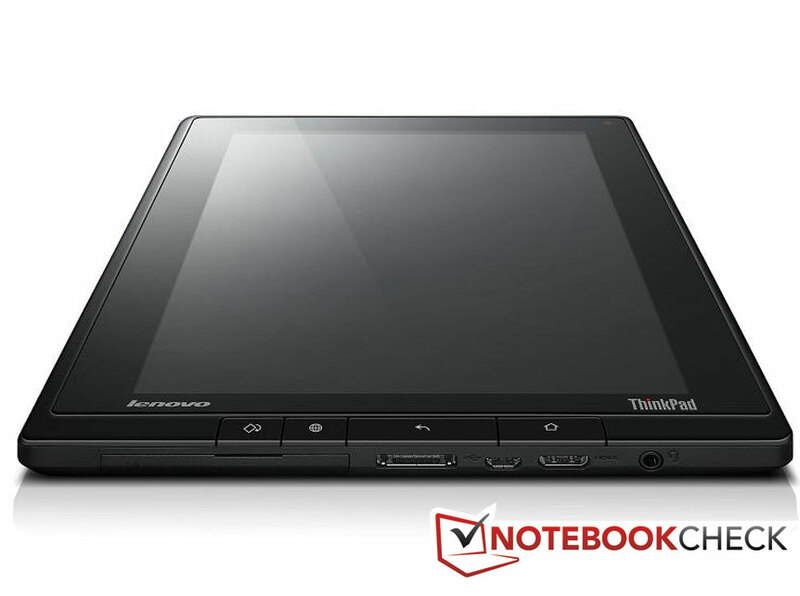 In addition the ThinkPad tablet is equipped with wifi, GPS reception and a 3G/ UMTS modem. The hard drive in our model is a generous 64 GB. That should be enough to start with. It makes similar tablets like the Motorola Xoom or the Sony S1, with their base level of onboard memory at 32 and 16 GB respectively, look practically miserly. 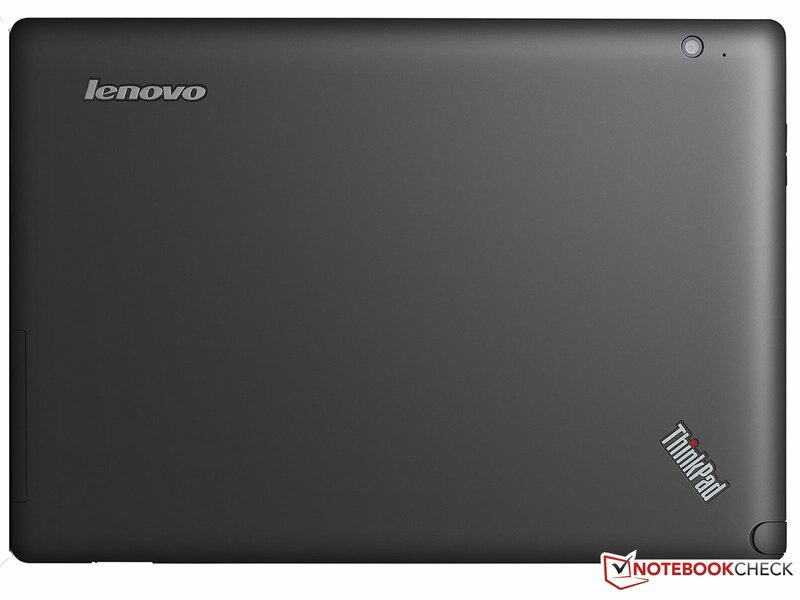 The Lenovo tablet’s memory can also be expanded using ordinary SD flash memory cards. For the display, Lenovo has not gone for any old cheap panel, but has chosen an IPS display with a screen diagonal of 10.1 inches. And with the resolution too, Lenovo has not made any compromises; in this device it is 1280 x 800 pixels. 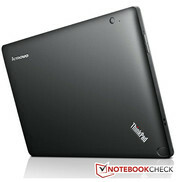 And the Lenovo ThinkPad tablet has still more to offer: for example, a good price. With the specs named above, the tablets costs around 666 Euro at present (high street price including tax, as of 1/10/2011). 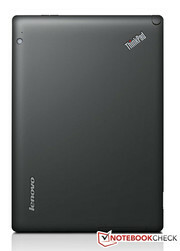 In the Lenovo web shop the 64 GB model costs 749 Euros including tax. 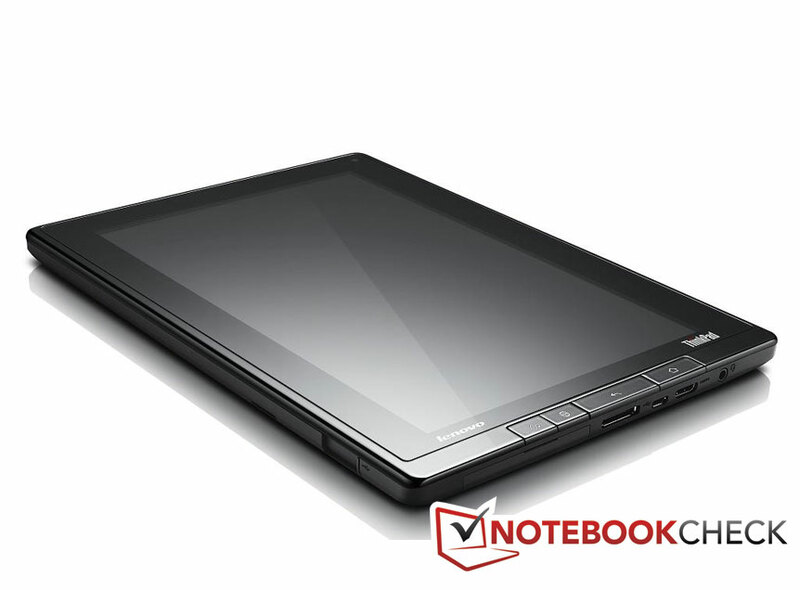 Visually, the Lenovo ThinkPad tablet is immediately striking. 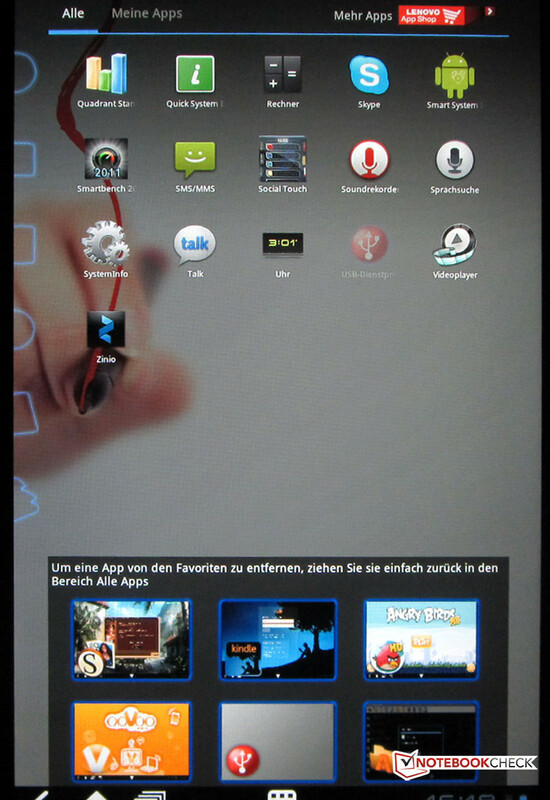 With dimensions of 14 x 58.4 x 181.7 mm it is not one of the slimmest tablets, and so initially it appears rather bulky. You also have to have a good grip on it because of its weight; at 750 g, the ThinkPad is not exactly the lightest tablet around. To compare: the iPad 2 weighs only 613 g, although the Motorola Xoom is similar to the Lenovo at 730 g.
The chassis is black all over, and for the material the manufacturer has opted entirely for plastic. This has the disadvantage that the back of the tablet can easily be pressed inwards. From time to time the two parts of the case shell creak if you press too hard on the tablet. We would have expected a slightly more superior first impression from something with the ThinkPad branding. Around the 10.1 inch display, Lenovo has left lots of room for holding the tablet. Four relatively large buttons stand out and put one in mind of a harmonium. These are not just touch-sensitive buttons, as with many other tablet models, but real mechanical buttons, almost like those on a keyboard. 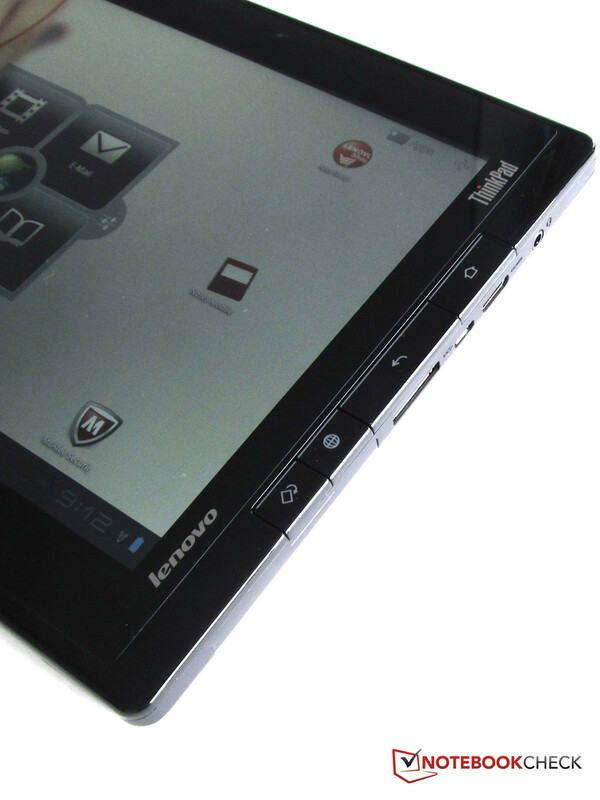 As far as ports are concerned, the Lenovo machine offers everything you need on a tablet. Almost all the ports are located in the middle of the right-hand side (in landscape format). Amongst them are a mini-HDMI port, a micro-USB port, a connection for an optional docking station and the headphone output. 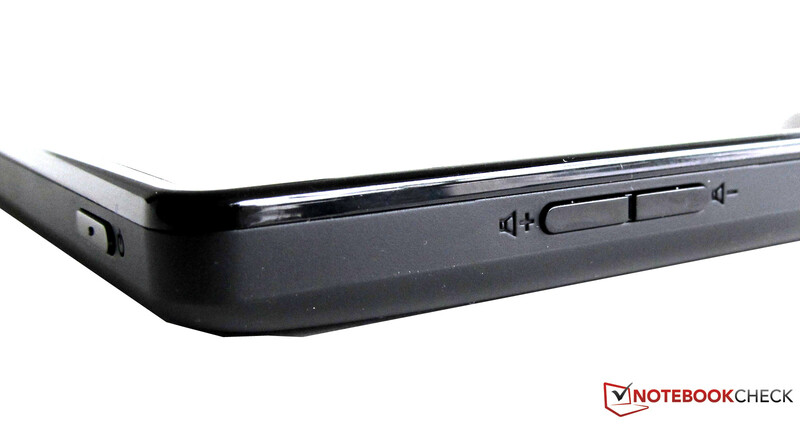 Beneath a cover you can find an SD card slot (in the industry-standard SD format) as well as a SIM card slot. On the opposite side is the slot for the digitizer pen and the rocker switch for volume. 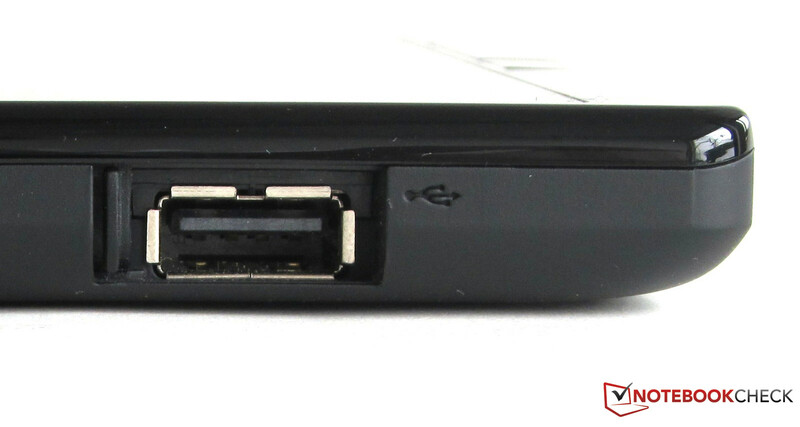 The mini-HDMI port is capable of producing a FullHD resolution (1080p). On the underside there is, behind a little sliding door, a USB host port for external USB drives, cameras or memory sticks. External hard drives which don’t have their own power supply can also be connected via this port. The on/off button is the only element on the top side. The Lenovo tablet can be recharged only using the micro-USB port, which can also be used for exchanging data with a PC or notebook. Under Windows 7 and Windows Vista, the ThinkPad is immediately recognised as a removable storage device. The data transfer speed was around 25 MB/s, which is within the normal range for a USB 2.0 port. When in use, the dot of the ‘i’ in ThinkPad glows red. During boot-up, an elaborately designed animation is shown. The USB port can be covered up by a sliding door. 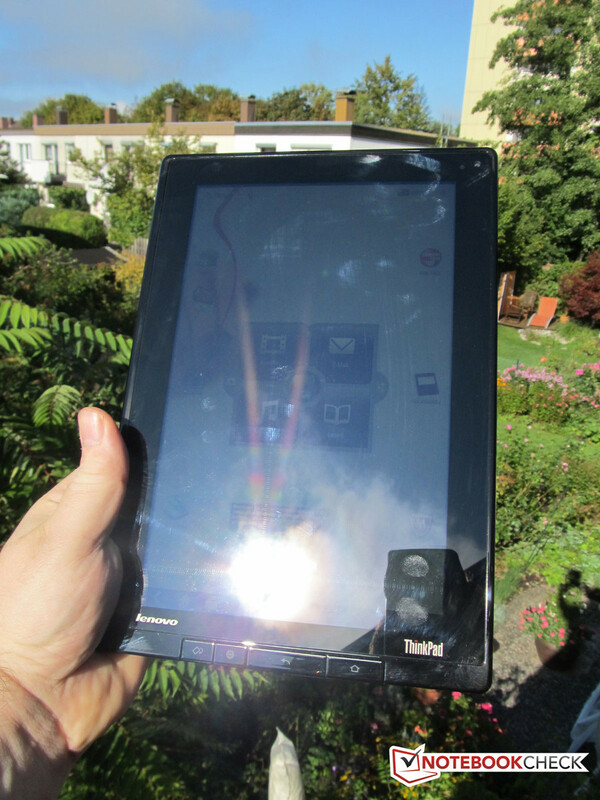 For connecting to a business, household or internet network, there are three possibilities available in the Lenovo tablet: as well as WLAN (b/g/n standard) and Bluetooth 2.0, the ThinkPad tablet can also connect to the internet via the integrated 3G-compatible modem and a corresponding SIM card. The service provider for the SIM can be freely chosen. The internal modem supports GSM, 3G and HSPA in the frequency ranges of 850, 900, 1800 and 1900 MHz. Connecting to a hotspot or logging into an access point is simple and can easily be adjusted with using on-board means. The reception was good on average, and the range was also convincing. 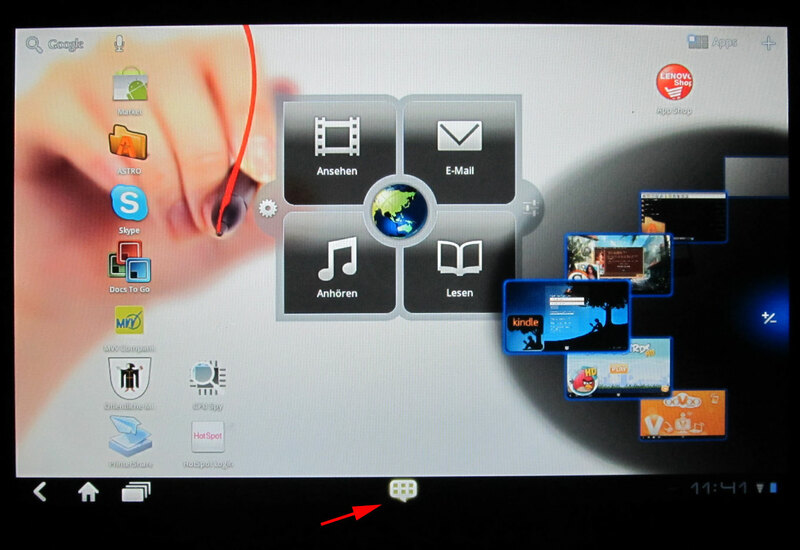 As a special feature, the Lenovo tablet can operate as a wifi hotspot. But, only if it is operating over a 3G (UMTS) connection. The activation of the internet connection is performed using WPA/ WPA2-PSK encryption or without it. The Lenovo ThinkPad tablet is also fitted with a GPS receiver. With data received from satellites, the device can be used as a navigational tool. The appropriate software - other than voice output - is pre-installed. 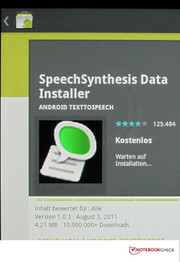 The Text2Speech apps are available for free in the Android app store. 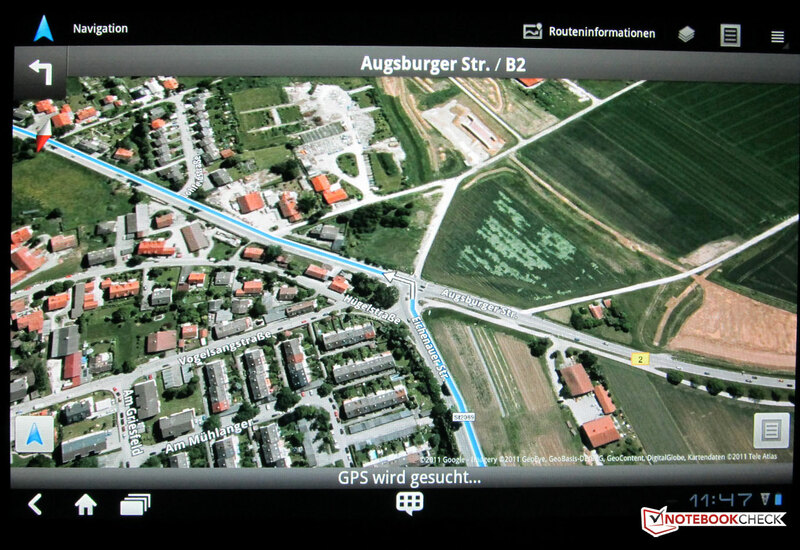 The navigation software relies on map content from Google Maps and can show terrain or satellite views if desired as well as the street maps. 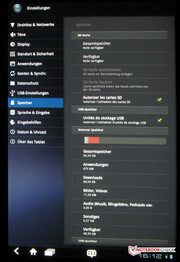 Once the Text2Speech app is installed, instructions for changing direction (‘Please turn around’ or ‘Turn left at the next set of lights’) can be broadcast by the tablet’s small loudspeakers. 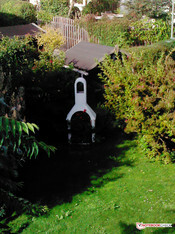 The GPS receiver, however, only works after a long search for the GPS satellites. It took more than an hour for the tablet to report that it had GPS reception; and in houses with double glazing, no GPS signal could be received. 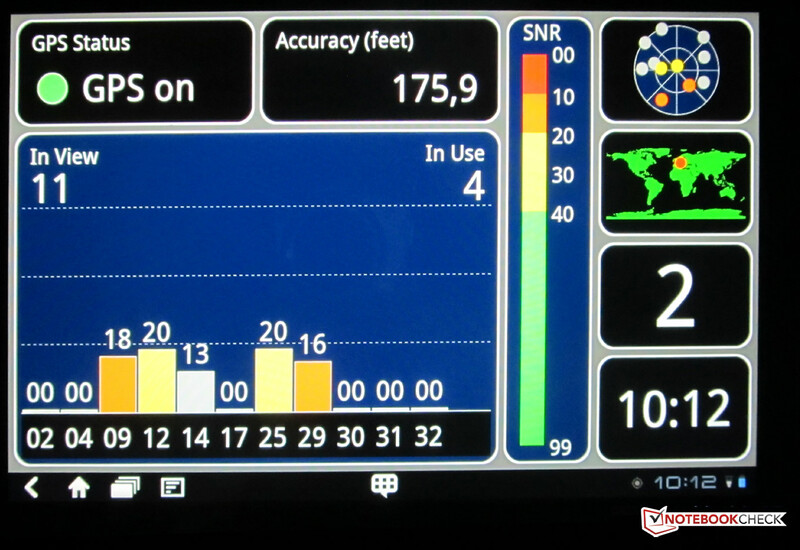 The GPS data can be used in conjunction with Google Maps or Latitude amongst other things. Both apps are pre-installed. 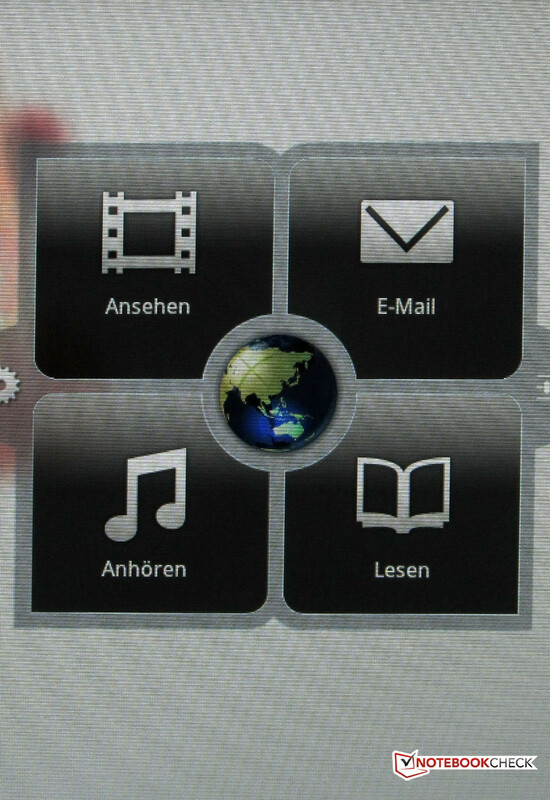 Fully fledged navigation software is pre-installed. 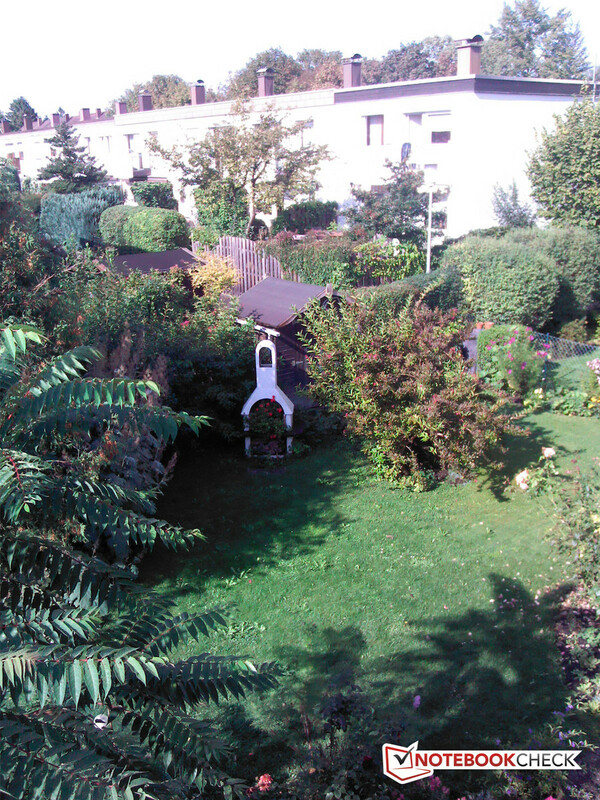 The GPS reception is best when outside. Additional app for GPS reception. The ThinkPad tablet is protected by Computrace Persistence technology from Absolute Software, which is pre-installed and already activated on arrival. Once the software has been activated, the Computrace technology creates a permanent connection to the ThinkPad tablet as soon as it is reported as lost or stolen. Using this technology you can lock the device, delete data and call up other security and control functions remotely. In addition, McAfee Mobile Security is pre-installed. This contains McAfee VirusScan Mobile, McAfee WaveSecure and McAfee SiteAdvisor for Android, which not only protects the tablet from mobile phone viruses and spyware, but also allows you to surf the web safely. 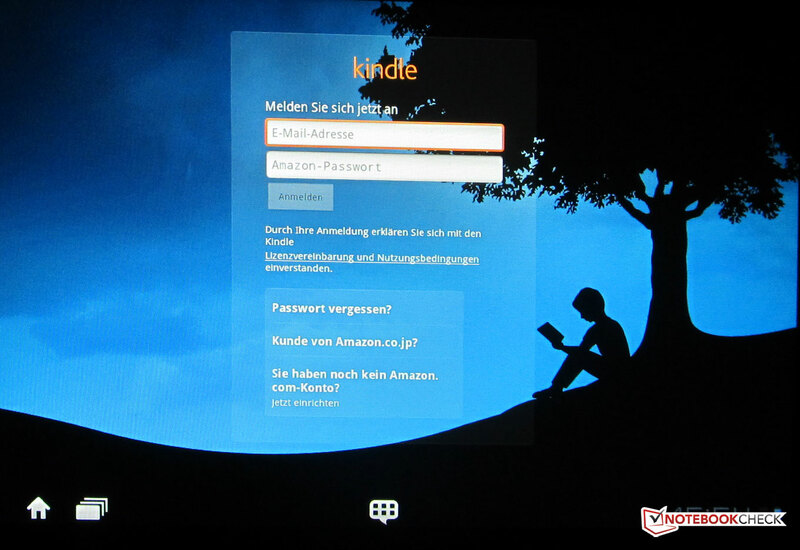 The tablet can also be protected using a password on start-up and an administrator password. Delivered free along with the tablet, you get a recharging adaptor and the USB cable that goes with it, and also in-ear headphones and a small velvet pouch. The digitizer pen is an optional accessory that costs 30 Euros. 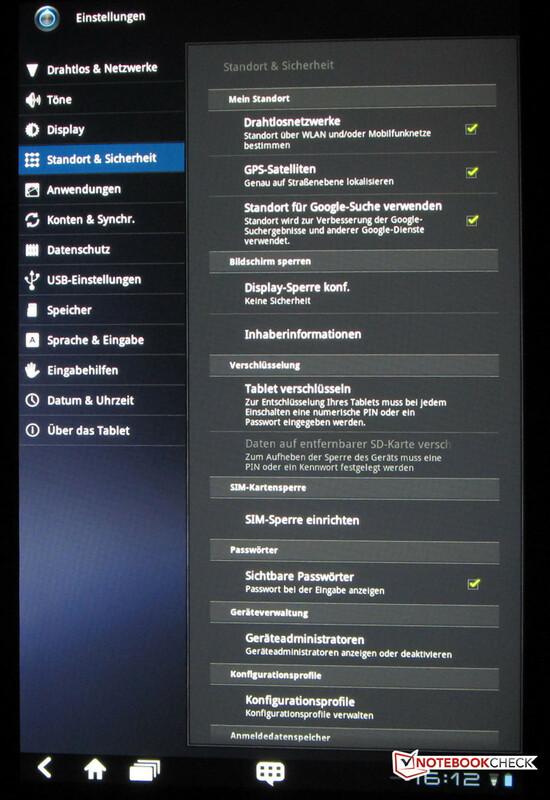 There should also be a docking station available for the tablet shortly, which will cost around 50 Euros. The manufacturer’s warranty for Lenovo is 12 months, and can be extended to up to three years for an additional cost. A warranty that includes ThinkPad Protection (includes damage caused by a fall, spilled water or an electrical surge) costs 130 Euros. For three years of this service, you pay 246 Euros. Inputting text, web addresses or notes is generally done using the virtual keyboard, which appears when required. 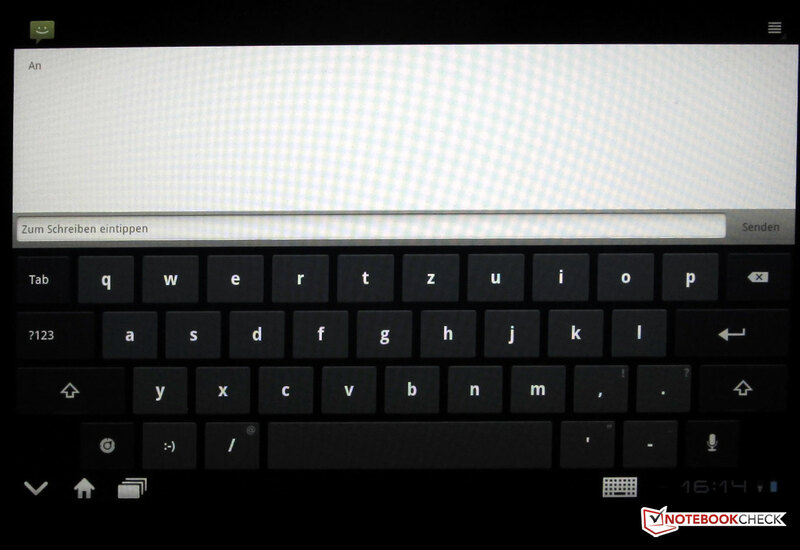 The QWERTZ keyboard then takes up half of the screen, and supports all symbols. 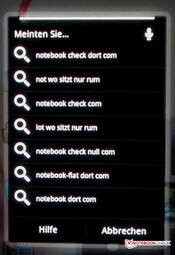 As with a mobile phone, extra letters pop up when they are available, like the letters ÄÜÖ for example. The inputs are accepted with a visible delay, which is particularly noticeable when you are writing quickly. If you turn off predictive text, the letters are accepted directly after the input. Entering text via ‘Swype’, as we were able to on the Dell Streak, is not supported on this keyboard for the Lenovo tablet. But you can work around this using retrofitting keyboard apps that can be downloaded from the App Store. 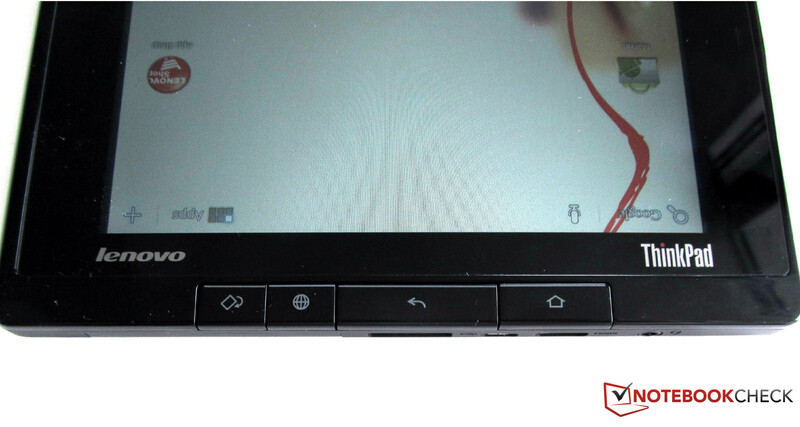 On the Lenovo ThinkPad tablet you see four buttons of difference sizes on the right-hand side, next to the display. 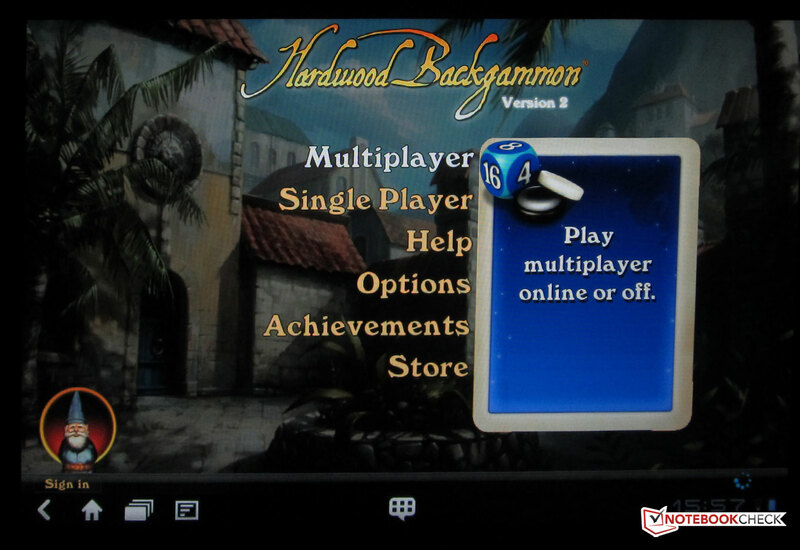 These allow you to quickly access the main menu, start up the web browser, change screen orientation, and return to the previous screen or application. 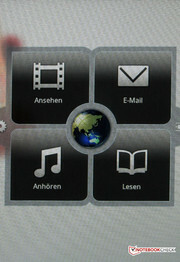 The point of tactile response on the buttons is not on the outside, but in towards the screen. This is supposed to minimize accidental pushes of the buttons. In fact, the buttons are (almost) superfluous, as all these functions always appear at the bottom left in the Android operating system (3.1). 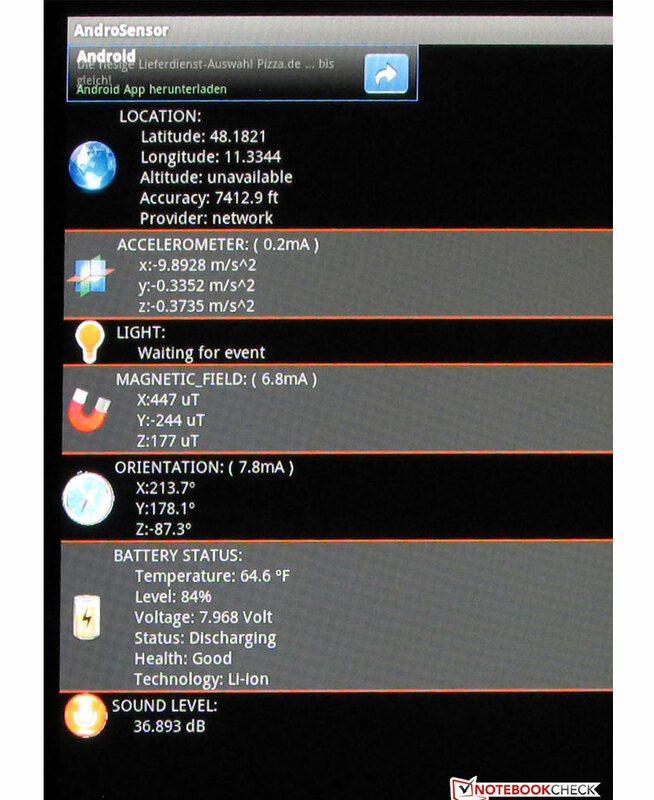 There are seven sensors at work in the Lenovo tablet, which detect data about its location, orientation, or magnetic field, for instance. The movement sensor (gyroscope) reads the three axes of the tablet (x, y and z axes), which can be used in games (for example) for controlling the on-screen character or vehicle. Another sensor, working via the integrated webcam, detects lighting conditions and so can automatically adjust the brightness of the display to match. 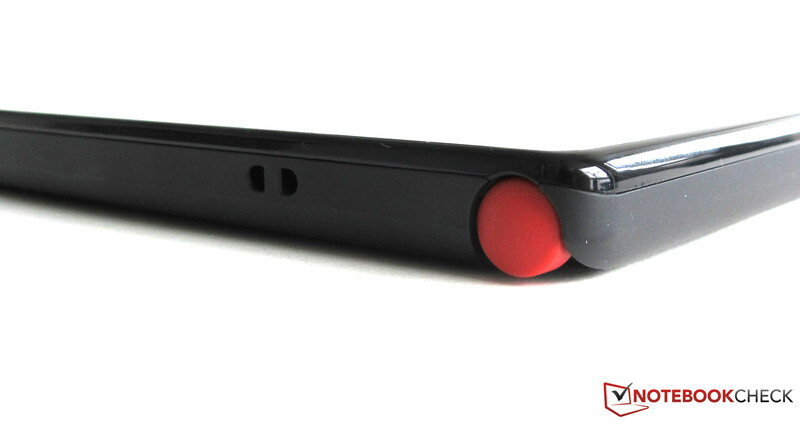 As an extra means of input aside from your fingers, Lenovo offers an input stylus in the shape of a ball-point pen. 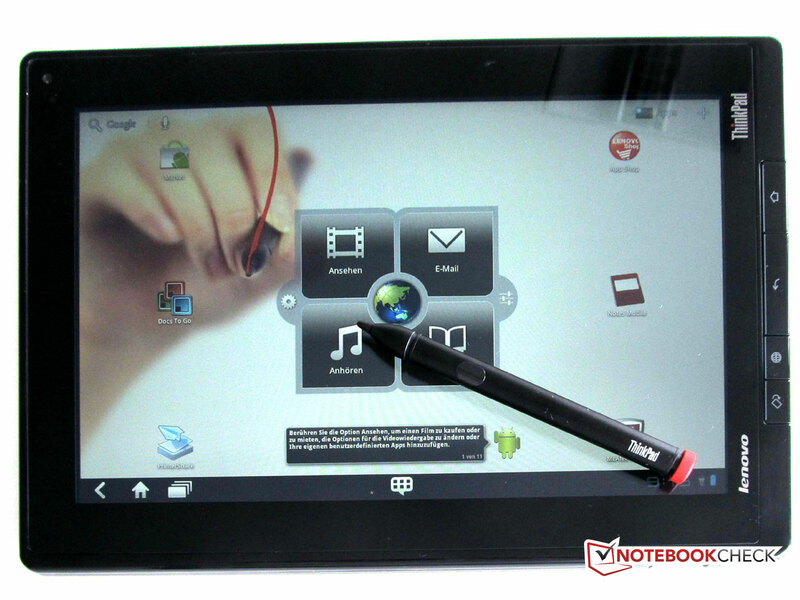 The ‘Lenovo ThinkPad Tablet Digitizer Pen’, to give it its full title, can firstly be used to control the tablet. 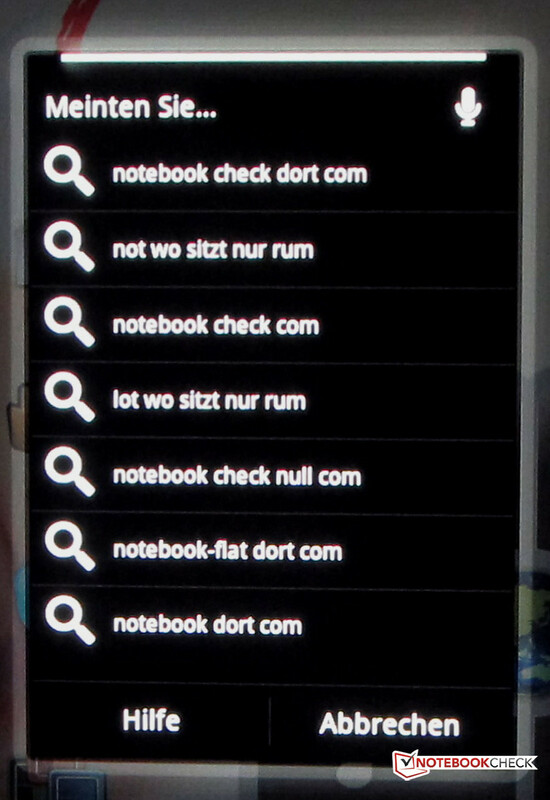 Secondly, with the appropriate app (My Script Notes Mobile) the digitizer pen can be used for writing on the touch-sensitive surface of the ThinkPad. The pen costs around 30 Euros. It even has its own slot in the tablet; it clicks easily into place so that it doesn’t slip out of its own accord and is always ready to be picked up when needed. If you write with the pen inside of the app, the written words are transformed into text using handwriting recognition. The text can also be edited using the pen; letters or whole words can be deleted (struck out), moved, or separated and put back together. 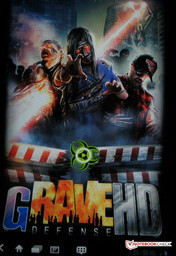 The writing feel was very pleasant, and its success rate was good. The app’s handling is outstanding. 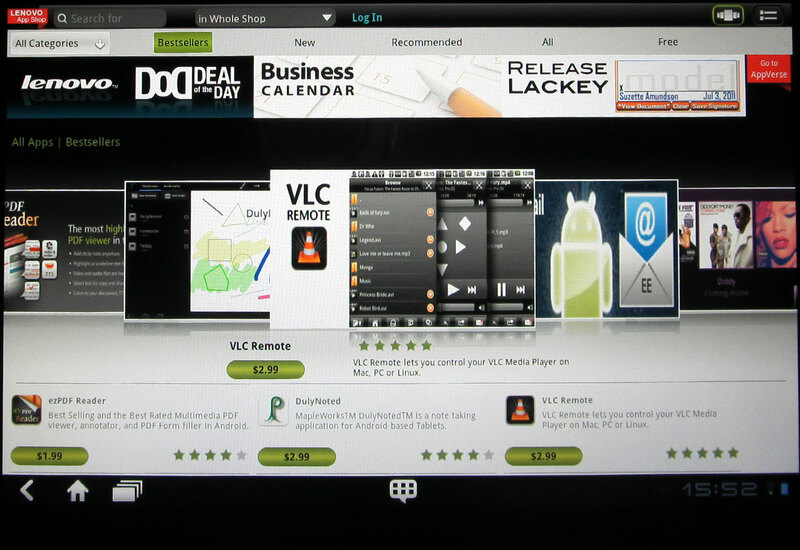 For beginners, there is a short video stored on the tablet, which however only begins to cover the range of functions provided by the app and the digitizer pen. 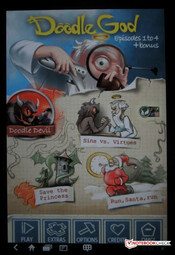 We were not able to locate a drawing program like the one on the HTC Flyer for example. 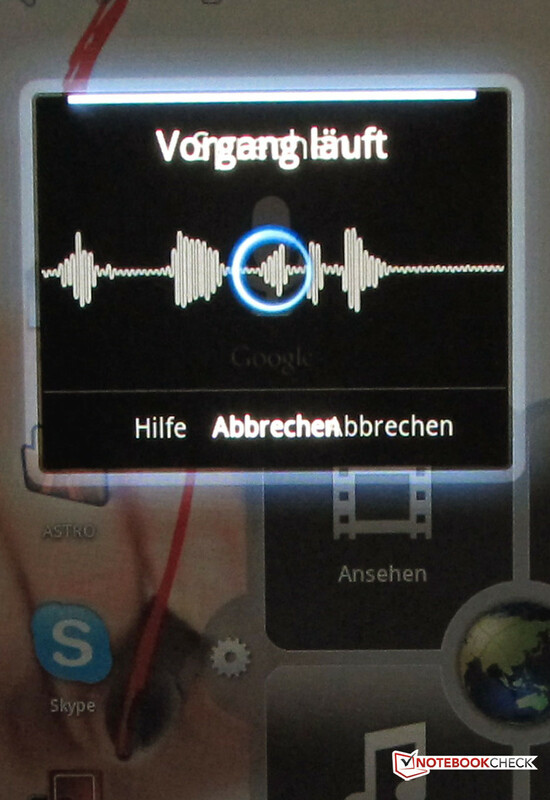 As well as input via the keyboard and digitizer pen, the Lenovo tablet also supports speech input. 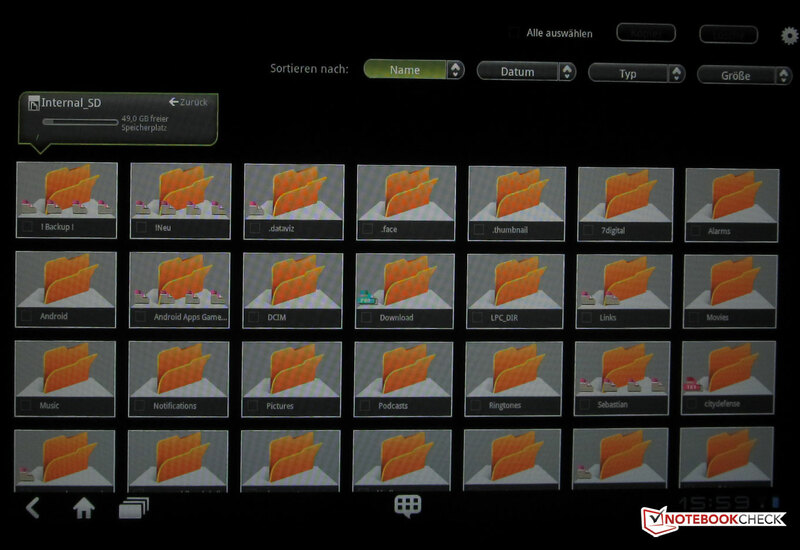 The spoken word is analysed and displayed to the user with various possible interpretations. The speech recognition works very well, if you speak slowly and clearly. 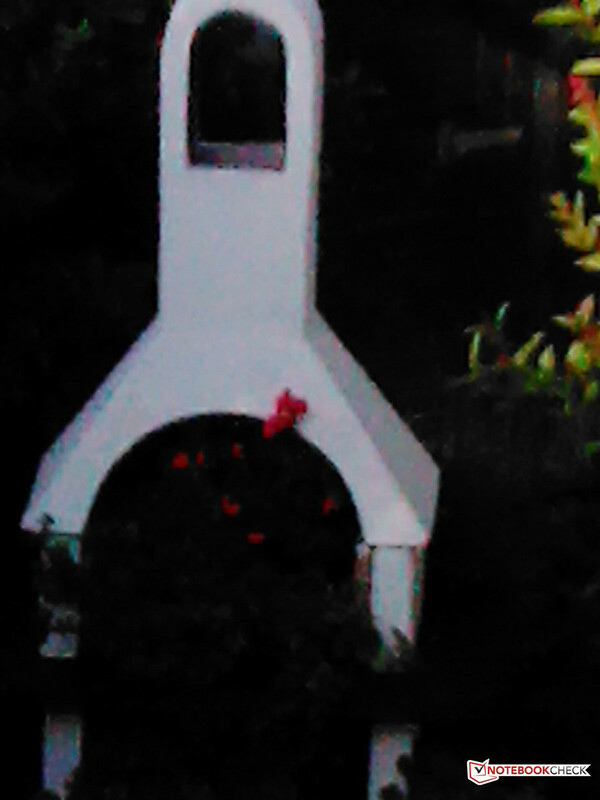 Our distance from the device during testing was around 50 cm. As a test word, we used the web address of our domain, including the dot, i.e. 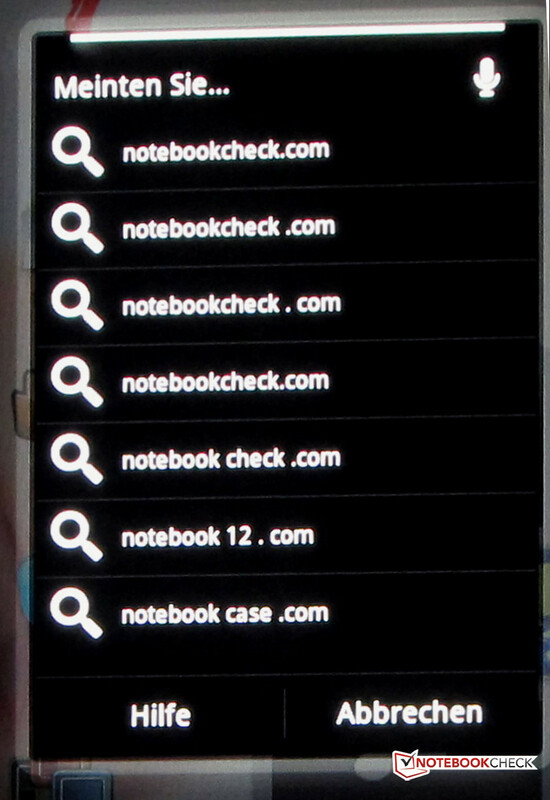 ‘Notebookcheck-dot-com’. As you can see from the following pictures, the success rate was not so high to begin with. Only once we spoke the url more slowly into the tablet’s microphone did the success rate become very high, allowing the address to be taken on by the browser. 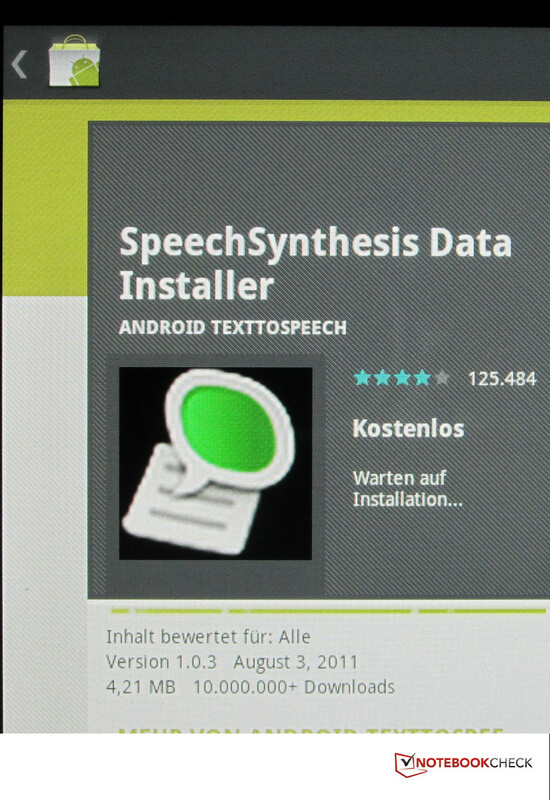 The speech recognition only takes a few seconds. The success rate was not satisfactory at first. 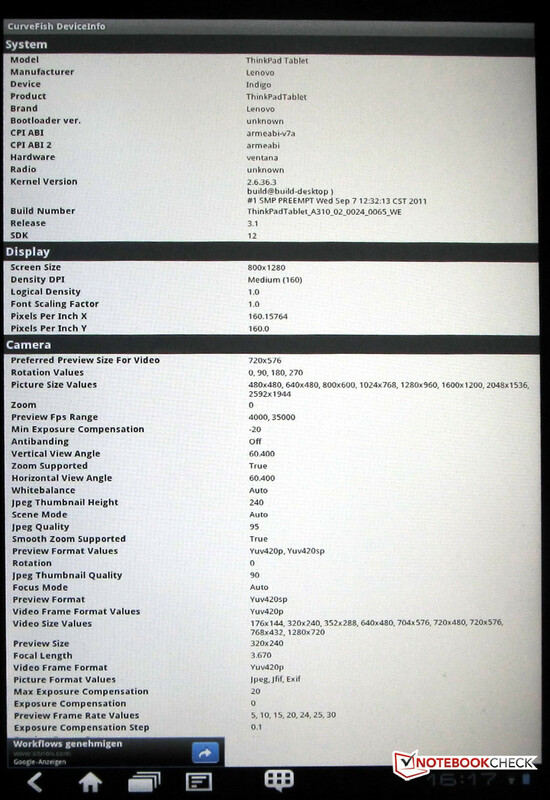 The 10.1-inch Lenovo tablet is fitted with two cameras as standard. The front camera with a 2 MP resolution has been placed by Lenovo in the left-hand corner of the device (when you hold the tablet in landscape orientation). This is particularly well suited to chatting over Skype or vvOvv (video chat). On the back you can find a 5 MP digicam with zoom capabilities (digital), but without a built-in flash. Both digicams are accessed directly using the 10.1-inch screen. As well as photos in a maximum resolution of 2592 x 1944, video clips can be recorded. Photos are saved in jpg format. The test pictures show our test pattern in each case, one without zoom, one with a magnification of 2.5, and once with the maximum that the lens can produce. 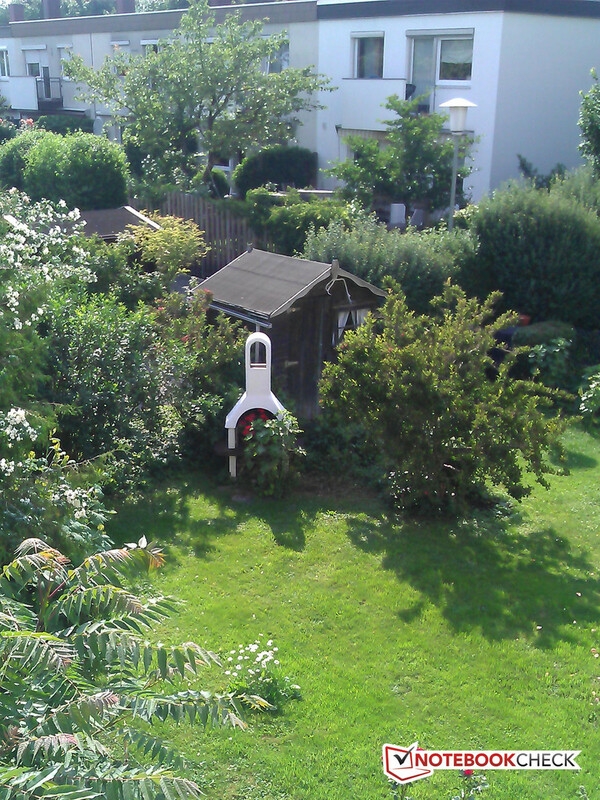 For a direct comparison, look at the same picture shot with a Canon Powershot camera and a modern tablet camera. The front camera (webcam) is also able to take pictures/ recordings (photos and videos). The lens of the webcam, however, has no digital zoom and no flash. When it comes to the display, Lenovo has made the excellent choice of a high-quality IPS panel which is also improved with ‘Corning Gorilla Glass’. 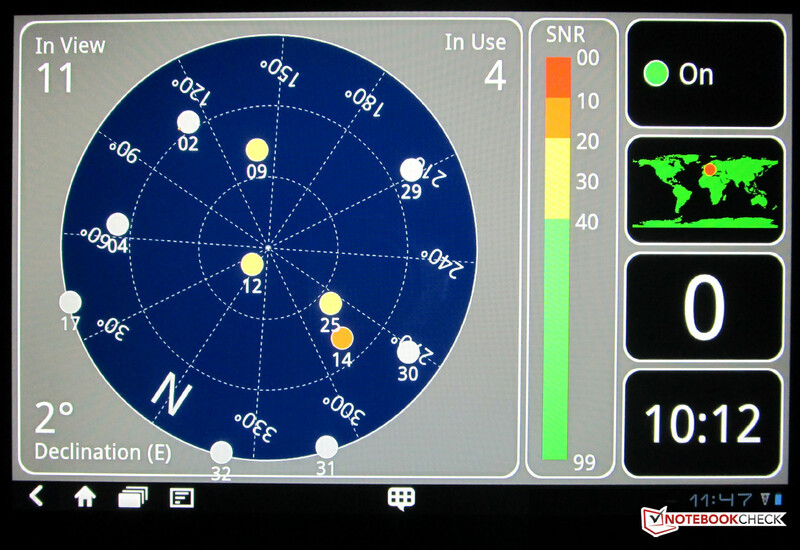 The capacitive touchscreen has a WXGA resolution (1280 x 800). The 10.1-inch touchscreen can reproduce 16.7 million colours with a pixel density of 166 DPI. The surface of the IPS display is (unfortunately) glossy, as with all other tablet PCs of any note that are currently available. Reflected images of yourself or your surroundings appear in almost every situation. The reflections are only reduced in darkened rooms or at night. 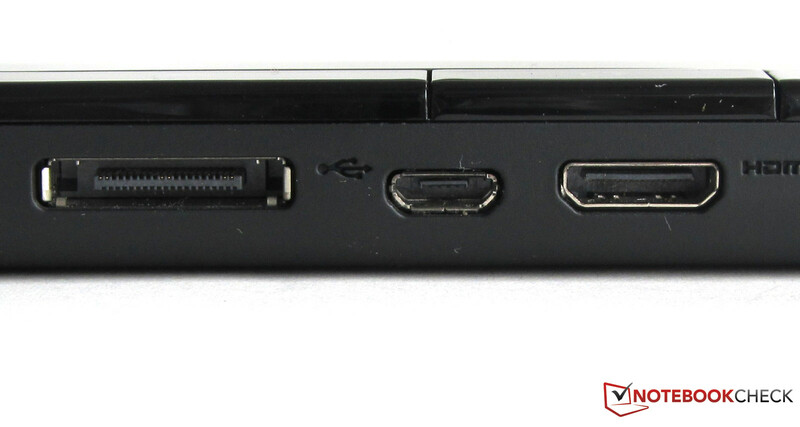 Using the HDMI port positioned on the side of the device, the screen contents can also be transferred to an external display (FullHD, 1920 x 1080). The Lenovo tablet’s colour reproduction seems very vibrant to the naked eye. Our measurements give a maximum brightness of 363 cd/m². The brightness only falls off noticeably in the top left corner. Here we measured ‘only’ 287 cd/m² (76 cd/m² less). 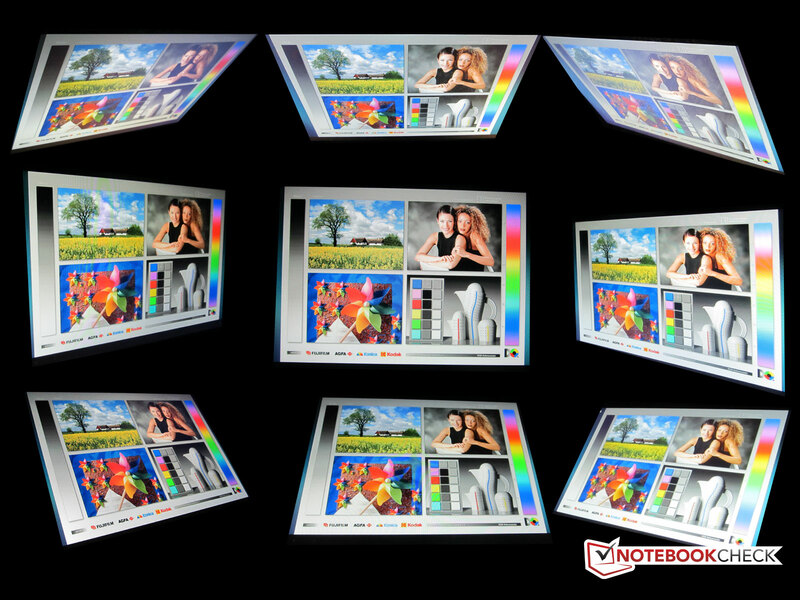 The display’s distribution of brightness is 79%; the average brightness for this display is 324.5 cd/m². The black level was measured by us to be 0.48 cd/m². With this we were able to determine a contrast ratio of 763:1 in the central display area. Outdoors and in direct sunlight, the IPS display does have its problems, firstly with brightness and secondly with the glossy surface finish. 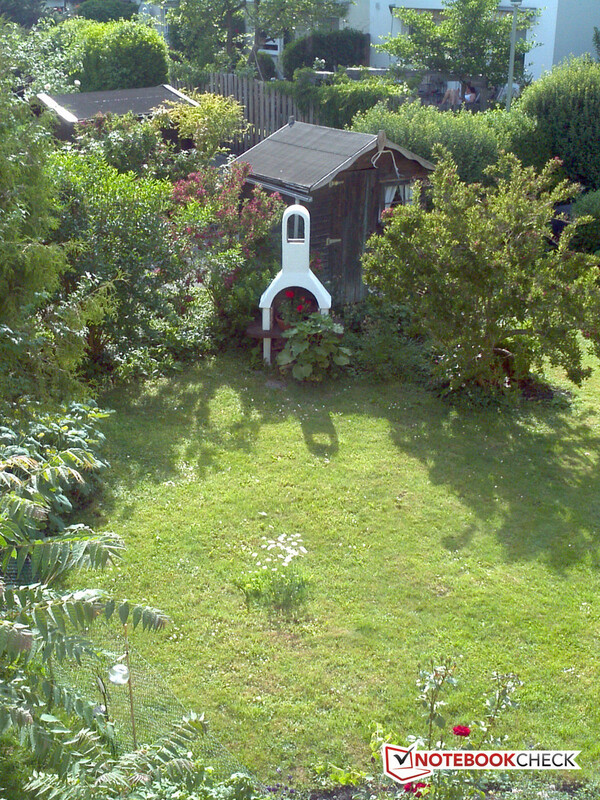 The screen contents, however, could always be made out even in direct sunlight. 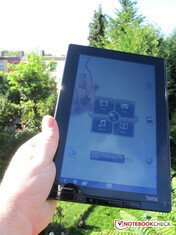 The Lenovo tablet used outdoors. 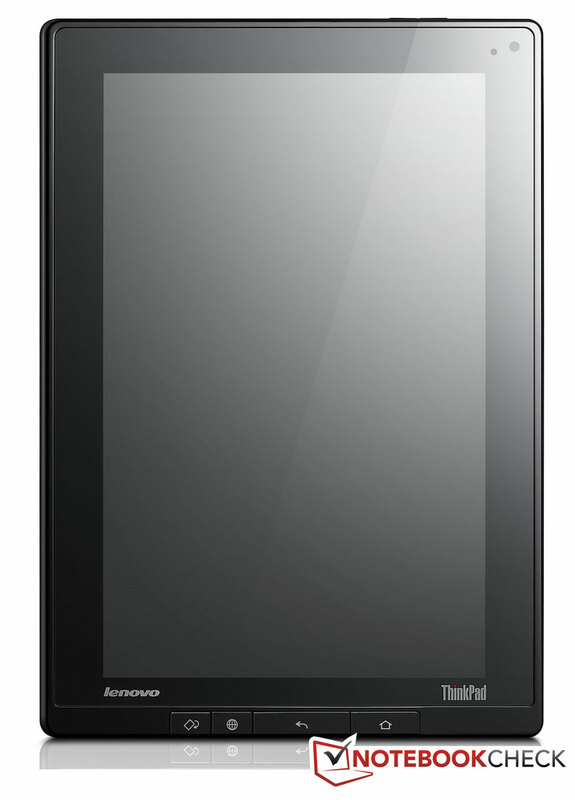 Lenovo lists a viewing angle of 178º in its technical specifications for this tablet. This is achieved through the panel’s IPS technology. We could only confirm this in our testing: the contents of the IPS screen were clearly discernible in almost every position, with good contrast. Even at extremely flat angles, we could still make out the screen contents clearly, without the picture inverting or washing out. It is very readily apparent that Lenovo has used a top-quality display panel. The only shame is that the display doesn’t have a matt finish. 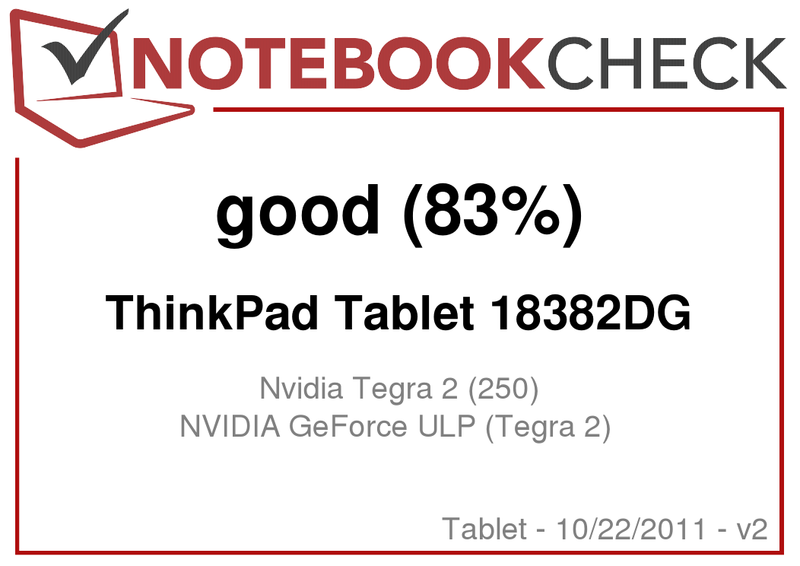 The Lenovo ThinkPad tablet, as with almost all other modern Android-based tablets, contains a Tegra 2 (ARM v7) CPU made by Nvidia. The Tegra 2, a so-called ‘system on a chip’ module (SoC), features the combined powers of a dual-core ARM Cortex-A9 CPU, GeForce Graphics (ULP-GPU), 1 GB of RAM and a sound card. Also contained in the Tegra-2 chip are two dedicated functional units for the decoding and encoding of videos. The decoder supports all three Flash video formats, H.264, Sorenson and VP6-E. 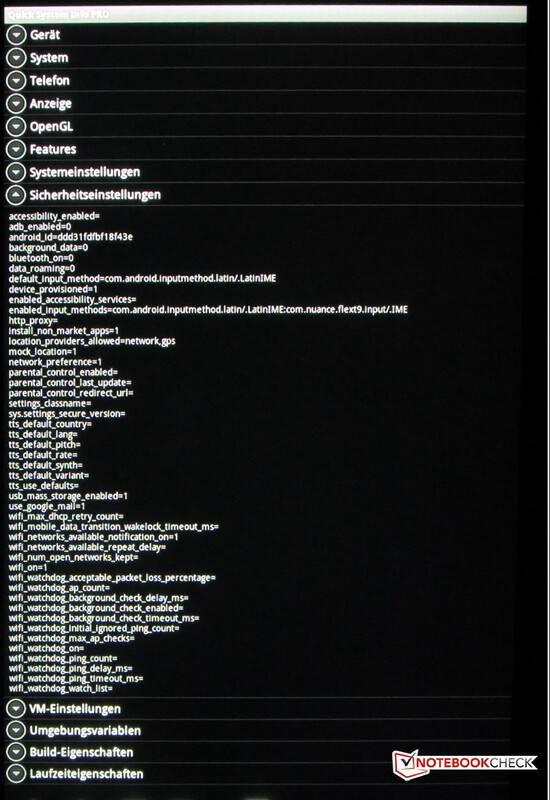 The Tegra 2 processor in this tablet also comes with a maximum clock speed of 1000 MHz. Depending on the application used, the CPU can slow down to as low as 266 MHz. 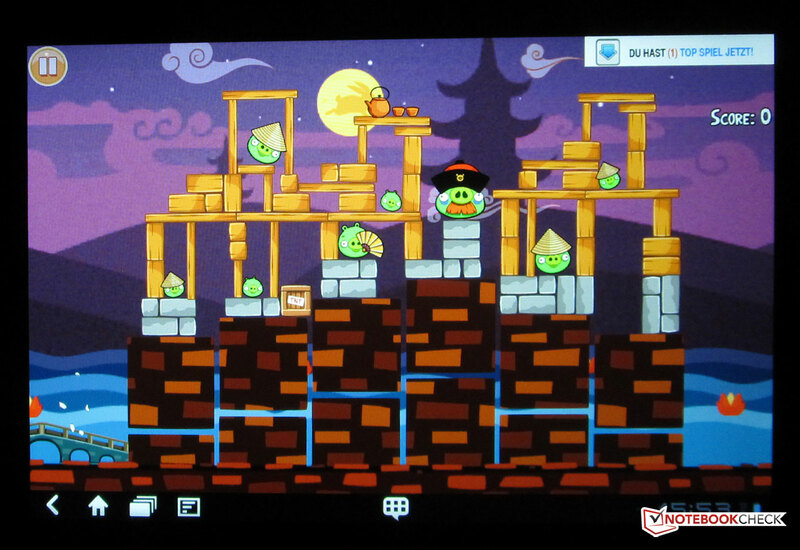 For graphics-intensive games (‘Angry Birds Rio’ or ‘GRave Defense’) or for playing a H.264 file, on the other hand, the Tegra 2 is challenged and so delivers the maximum speed of 1000 MHz in these tests. 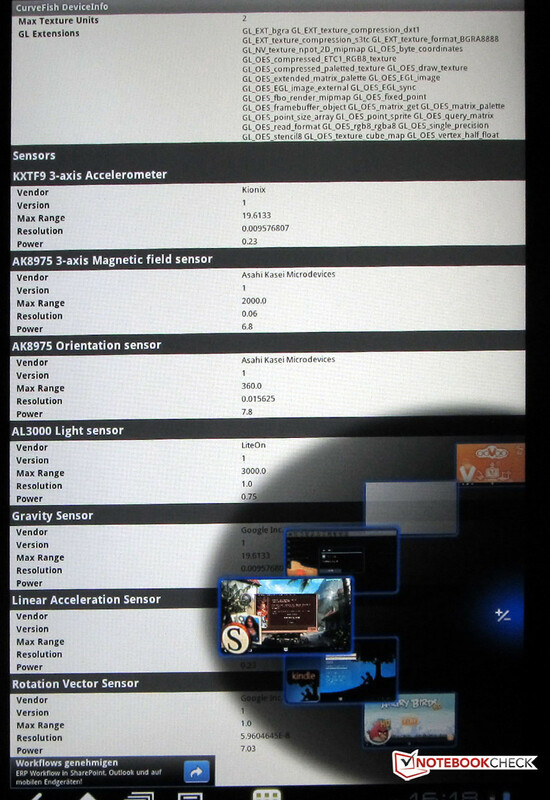 With the ‘CPU Spy’ app we mostly measured clock speeds of between 216 and 608 MHz with the Lenovo (alongside the 1 GHz), with the tablet favouring 216 MHz. The advantage of the variable speed is that less energy is required for the lower clock speeds, resulting in longer battery life overall. The hardware in the Lenovo tablet demonstrates in a wide variety of benchmarks that it has nothing to be ashamed of when compared to its rivals. 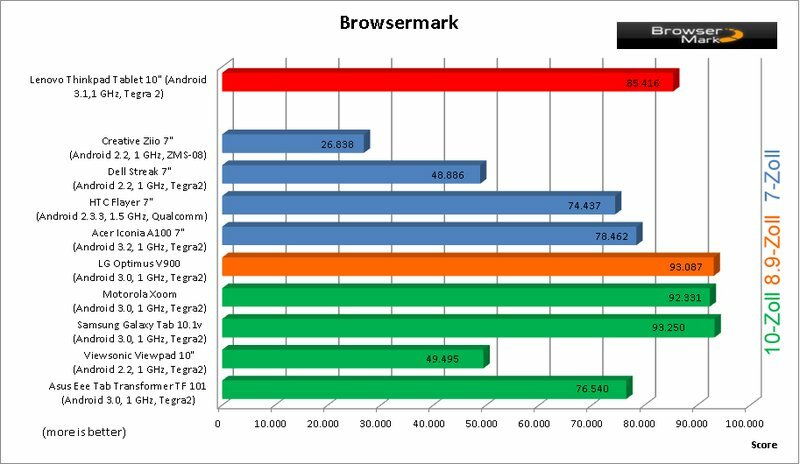 In the Browsermark test, the Lenovo tablet is one of the top scorers, leapfrogging over all 7-inch tablets tested by us so far. Of the competitors in the 10-inch class, only the Motorola Xoom and the Samsung Galaxy Tab scored better. The 8.9-inch LG tablet (Optimus V900) also bested it. 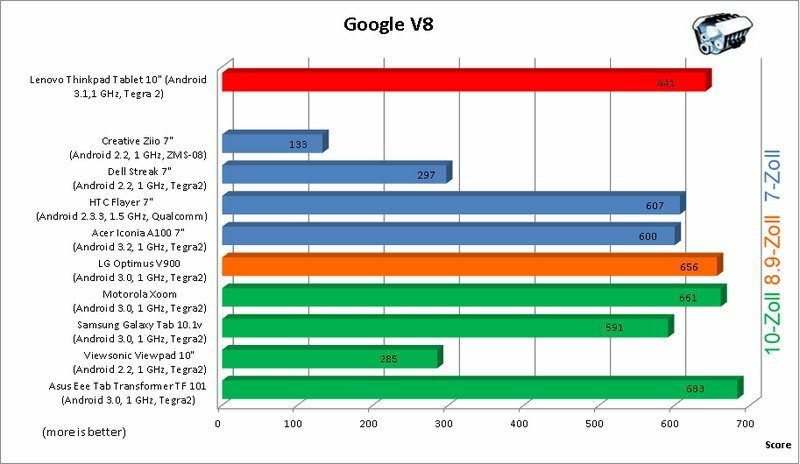 The result of the ‘Google V8’ benchmark placed the Lenovo tablet once again amongst the top 5 devices; it only had to admit defeat to the Xoom (Motorola), Optimus (LG) and Transformer (Asus). 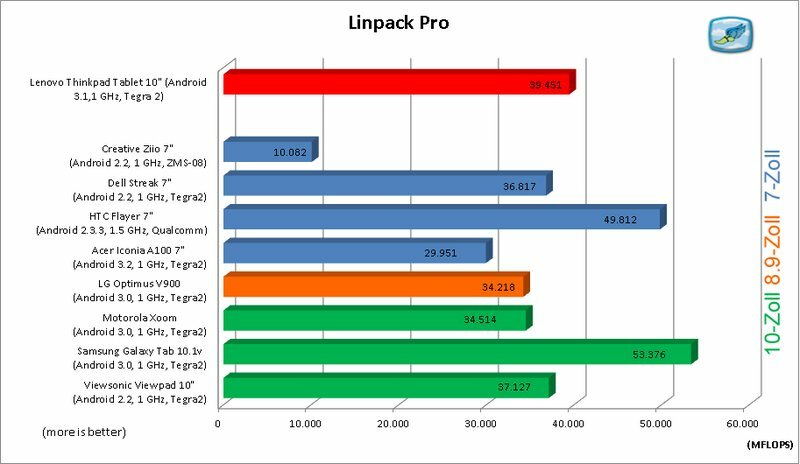 In the Linpack Pro test the Lenovo climbed up to third place with 39.451 MFlops, surpassed only by the Samsung Galaxy Tab 10.1v and the HTC Flyer. 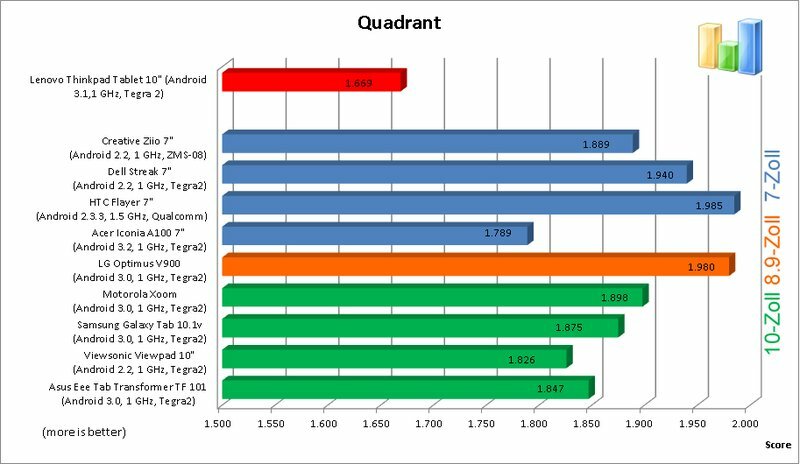 The Lenovo tablet could only manage 1669 points in the ‘Quadrant’ (standard) benchmark, putting it considerably below all the tablets we’ve tested previously. Repeating the benchmark did not bring any improvement. 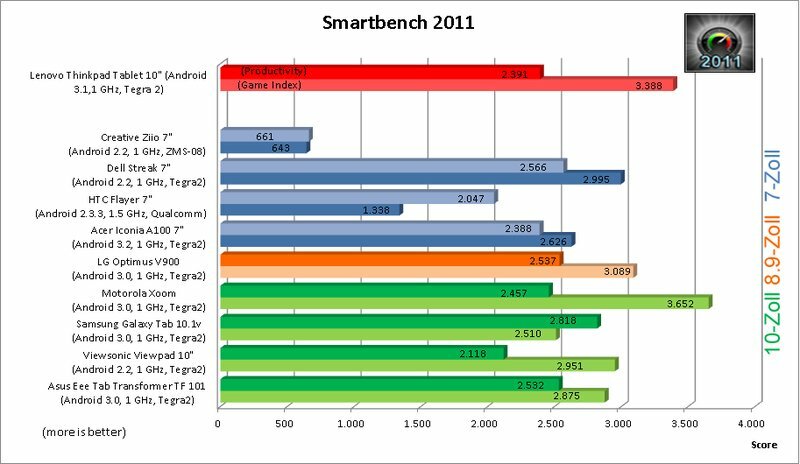 The tablet’s score in Smartbench 2011 was enough to put it in the top 5 again (productivity test). In the gaming index, the Lenovo tablet was second only to the Motorola Xoom. This was only 300 points ahead. 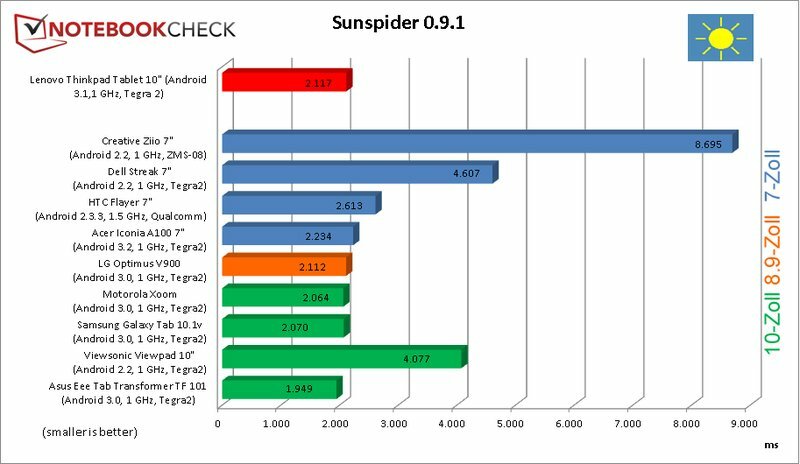 In the Sunspider benchmark, the Lenovo tablet ranked on the same level as other Tegra 2 contenders, with 2117 ms. Only the LG Optimus V900, the Motorola Xoom, the Samsung Galaxy Tab 10.1v and the Asus Transformer were faster. So all in all, this is a positive showing with respect to performance, compared to other tablet PCs currently available. 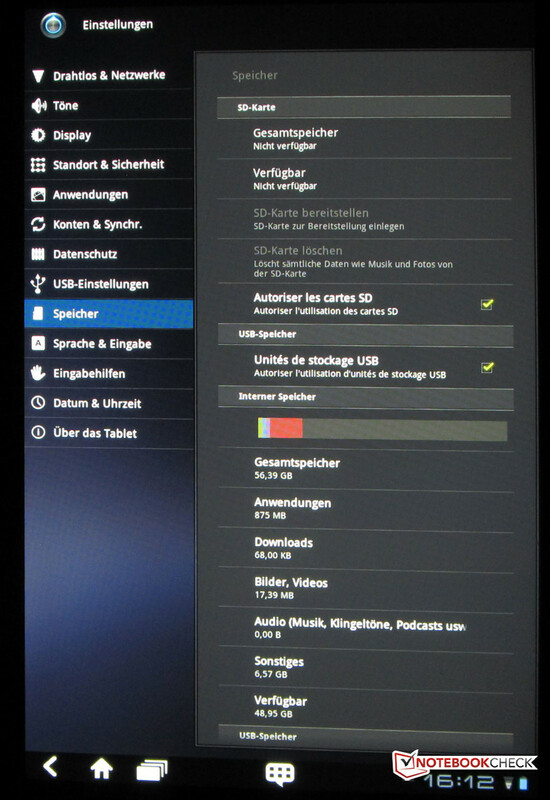 The hard drive (SSD) of the Lenovo tablet in this configuration has a whopping 64 GB capacity. This internal memory, however, can only be expanded upon using SD cards. The relevant card reader is positioned on the side of the device, beneath a flap. So in total you could get up to 128 GB (64 GB + 64 GB SD). 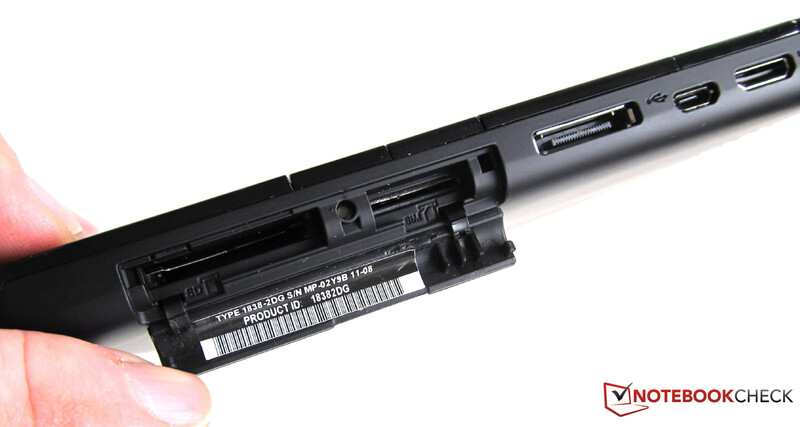 Alternatively you can also use completely ordinary USB sticks on the ThinkPad tablet. But in order to use the data (pictures, videos, documents...) on the Lenovo tablet, they have to be copied beforehand onto the internal memory (SSD or SD cards). Although this Lenovo ThinkPad is actually a business-oriented model, it is good for gaming, in the context of what is possible for tablets with comparable hardware. 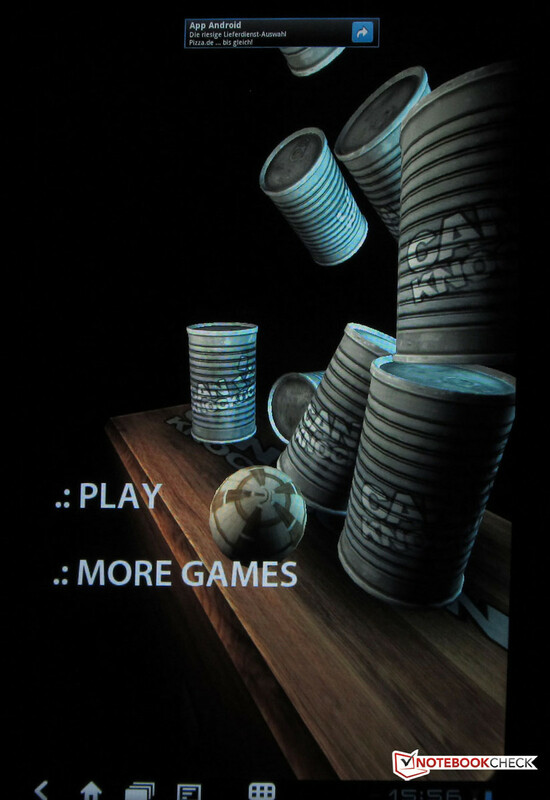 The IPS display and the responsive surface (with Corning Gorilla Glass and a capacitive multitouch panel) are perfect for Android games in HD resolution. Our gaming check showed us that the compatibility is very high; all HD games use the full display size, and only games that are well-known to be problematic in this respect - Settlers, Frogger and Asphalt 3D - restrict themselves to only a portion of the screen. The capacitive (6-finger) multi-touch panel reacts immediately to touch from finger inputs as well, with no perceptible delays. In the state that it’s delivered in, this reasonably priced, 666 Euro tablet (64 GB version) has a remarkable number of apps pre-installed. 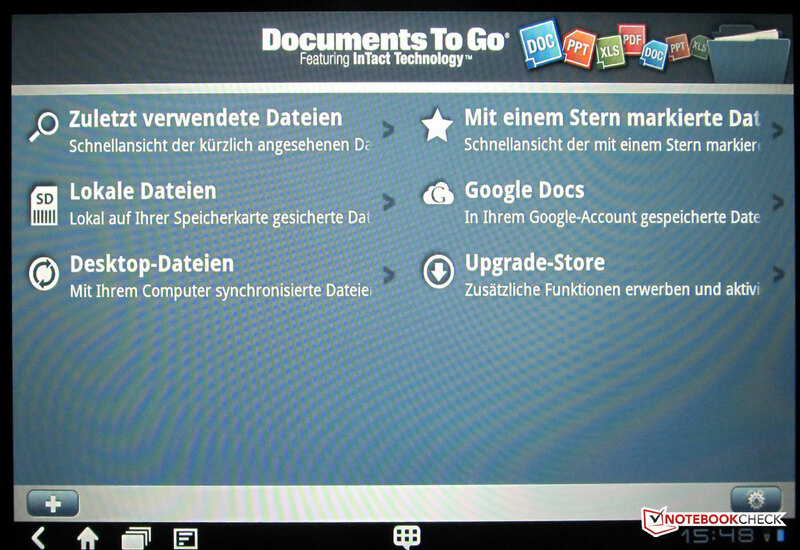 With ‘Documents to Go’ you are able to edit your office documents (Microsoft etc) while on the move. ‘Docs to Go’ supports doc, docx, exl, ppt, and pdf files. The last two in viewing mode only. The ‘Amazon Kindle’ app allows you to download e-books onto the tablet from this provider, and read them anywhere with the e-book reader. However, you do need an active Amazon account to gain access to the Amazon store. Your account details and/or credit card information must be stored with Amazon, even for free apps/ e-books. 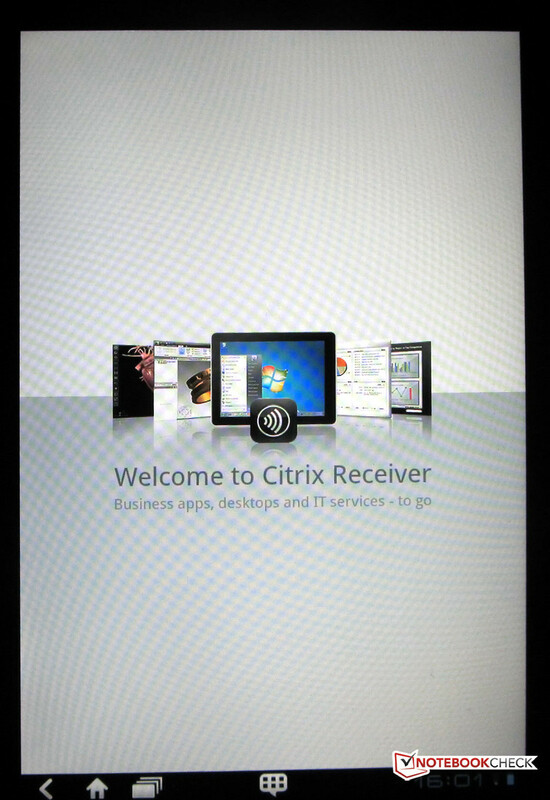 With Citrix Receiver, users of the ThinkPad tablet can access their business applications and desktops (virtual XenDesktop and XenApp infrastructure) and continue working productively wherever they find themselves. 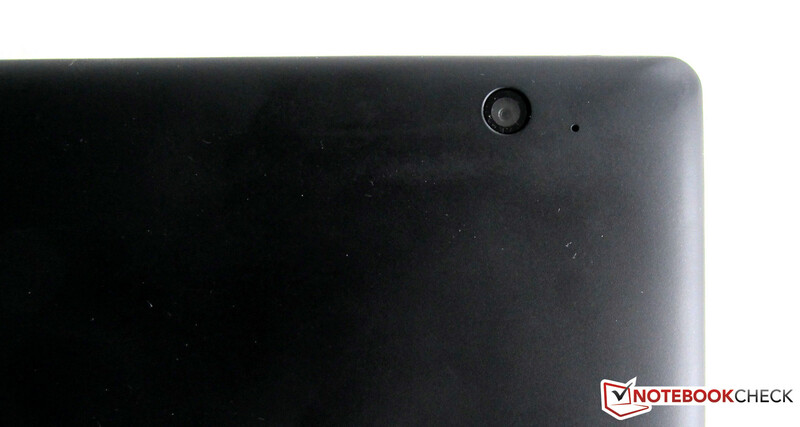 With the help of ‘ooVoo mobile’, the Lenovo tablet becomes a webcam for video chats or conferences. You need to have an account with the provider for this one too. This ‘game’ of setting up accounts is required for almost every app. Only Google apps can be ‘activated’ quickly via a Google Mail account that only needs to be set up once. The Mail account data is stored in the tablet’s account settings. 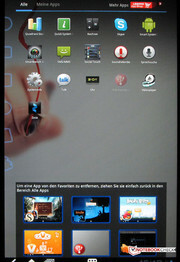 There are also various apps for multimedia files on the tablet. 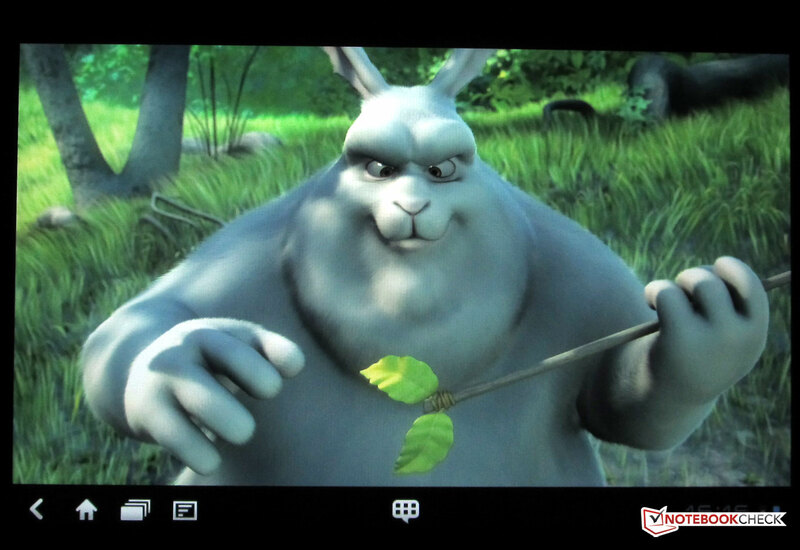 The video player supports all current video and audio formats. All our test files ran without problems or stuttering. 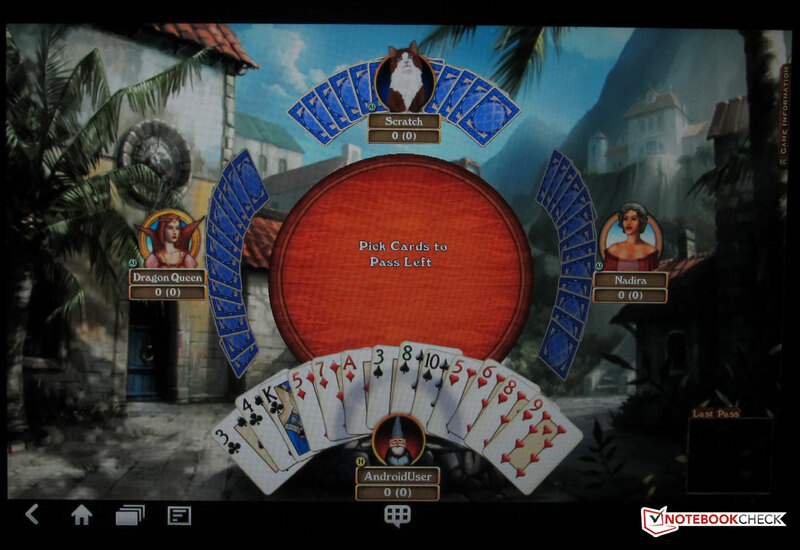 The tablet can be used as a player for an external flat-screen, via the mini-HDMI port on the side. On the Lenovo tablet there are two App Store links installed at the same time. One is for App Store access to Android Market, and the other is for access to the Lenovo Shop. 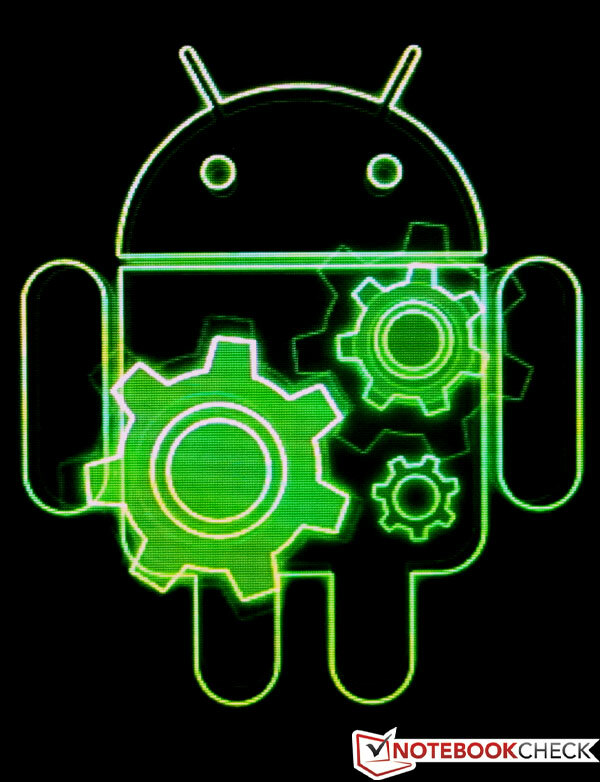 In Android Market, you can find everything to do with all types of Android devices - tools, games, applications (useful ones and useless ones) and so on and so forth. And the choice in the Lenovo App Store is no different: you get virtually the same range of products here, but you pay Lenovo instead of Google. 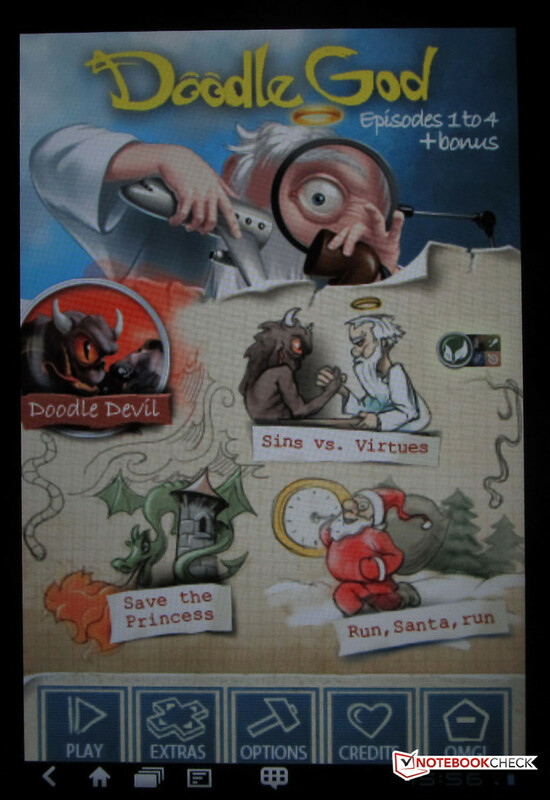 In both App Stores you can find free apps and ones you have to purchase. The Lenovo Shop has a fresher look than Android Market, but in the end it is just as confusing. Because there is no fan in the Lenovo tablet and also no moving parts, it runs completely silently. Even the buttons on the side are silent when you press them. One of the few negative aspects of this Lenovo tablet is its temperature gain: even in idle mode, we were able to measure up to 32 degrees in places (on the back in the middle). On the display side it was ‘only’ 30.1 degrees. With heavy use, the Lenovo ThinkPad gets much warmer. Instead of 32 degrees (in idle) the temperature on the back rises to 38 degrees Celsius, which you can feel even without a temperature gauge. 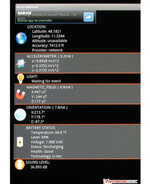 The temperatures on the display also rise, reaching a maximum of 35.5 degrees (in the middle, in landscape format). The small recharging adaptor becomes a good 8 degrees warmer (35.5 degrees) with heavy use than it is in idle mode. If you compare it to the Samsung Galaxy Tab 10.1v, the Lenovo tablet is substantially warmer. 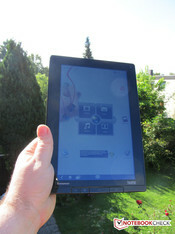 We measured a maximum of 29.8 degrees on the Samsung; the Lenovo tablet is a good 10 degrees warmer. 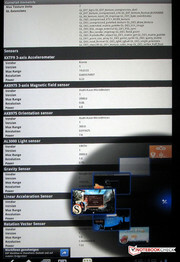 The Motorola Xoom was only 28.1 degrees with heavy use (display side) and a maximum of 26 degrees (back side). Only the Sony S1 exceeded the Lenovo ThinkPad in terms of temperature gain, by almost 2 degrees Celsius. (+) The average temperature for the upper side under maximal load is 27.1 °C / 81 F, compared to the average of 30.7 °C / 87 F for the devices in the class Tablet. (+) In idle usage, the average temperature for the upper side is 24.4 °C / 76 F, compared to the device average of 30.7 °C / 87 F.
For sound production, the Lenovo tablet only has a small loudspeaker, located next to the USB port. The sound quality is good, making a good impression even at full volume; unfortunately there is no bass at all, so the spatial depth in videos or musical pieces did not come across quite so well. For significantly better sound quality, use the headphones which come free with the tablet. The volume is controlled either directly on the tablet case by means of the volume rocker switch on the side, or within the Android operating system’s settings. The Lenovo tablet’s energy consumption when recharging is substantially higher than for 7-inch tablets, but with a maximum of 8.7 Watts it is on the same level as the other 10-inch machines. Our readings also showed that the recharging adaptor barely drew any electricity (0.2 Watts) when the tablet was switched off. However, in stand-by mode, the adaptor uses a little more (0.7 Watts). It takes much longer than expected to recharge! 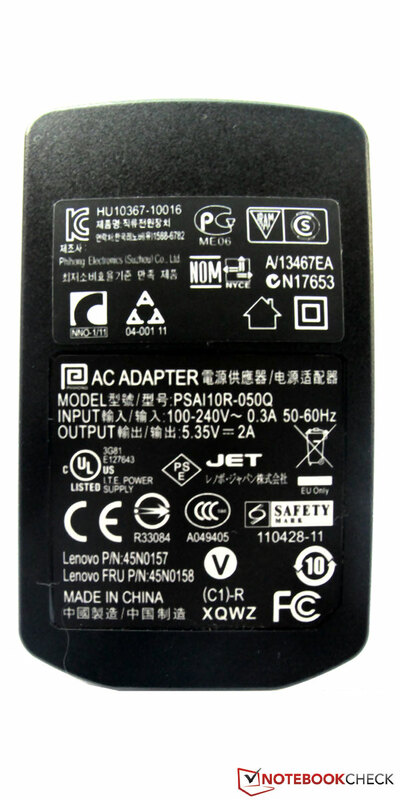 The Lenovo tablet’s battery (2-cell, lithium polymer) has a capacity of 24.1 Wh. Recharging is performed using the charging adaptor (included) with a USB output and the appropriate USB cable. 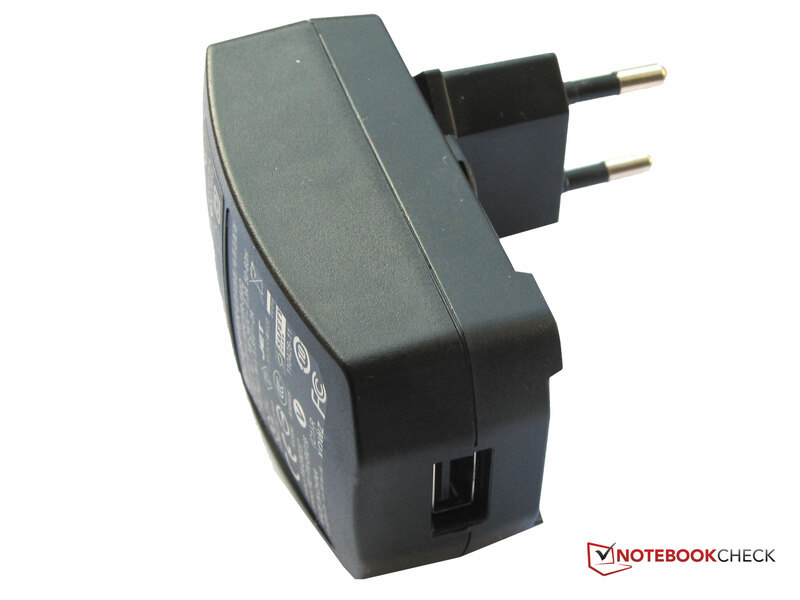 Alternatively the tablet can be charged via an ordinary USB port on your PC or notebook. In the last case, the recharging process will probably take longer. Even with the charging adaptor which is provided with the tablet (5.35V, 2A), recharging the battery takes patience. A completely empty battery can take up to 24 hours (!) to reach 100% battery capacity again. We tried out all the settings we could find on the tablet, but always with the same result: the recharging process could not be hurried. But this is intentional. We found the relevant notice in the handbook on page 36. 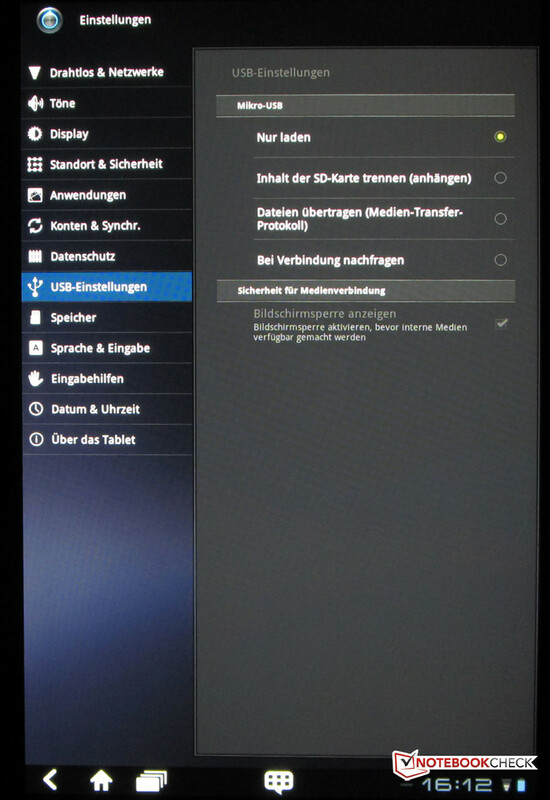 Only once the tablet dock is available (a forthcoming expansion) will a fast recharging method be supported. If the battery takes so long to recharge, it should at least last for a long time throughout our battery life test scenarios. Or so you would think. 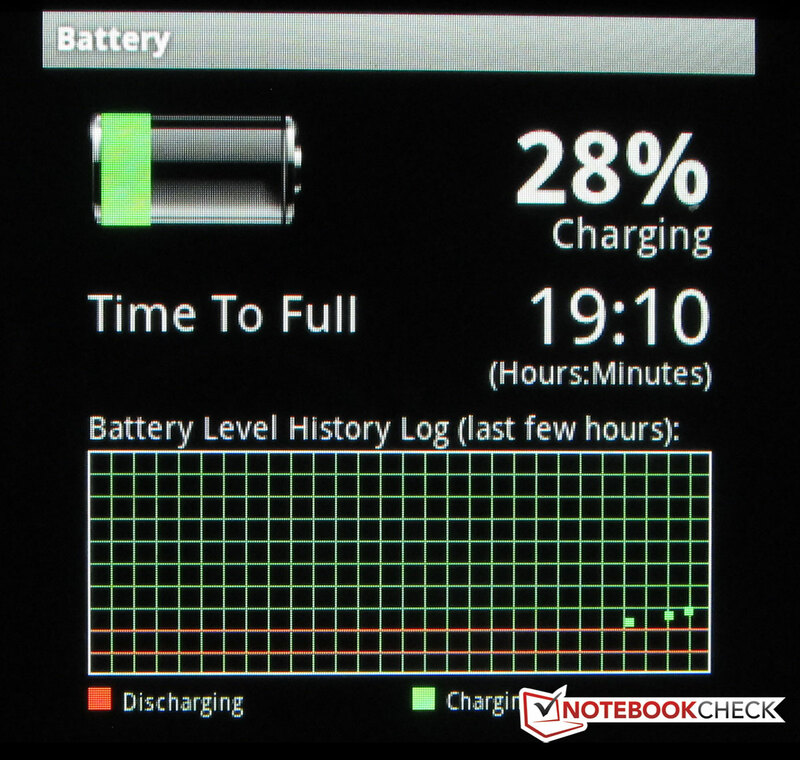 With heavy use, where stress is put on the Tegra 2 CPU, we observed a battery life of 6 hours and 2 minutes. Once recharged, we started the second test. 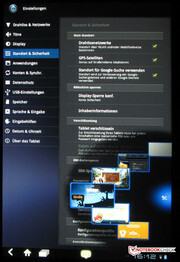 In this case, for surfing on the net via WLAN, the display was set up so that the screen contents would be easily readable. 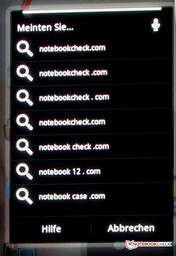 During the test, different web sites were loaded in turn. The battery held out for 9 hours and 45 minutes in this scenario. 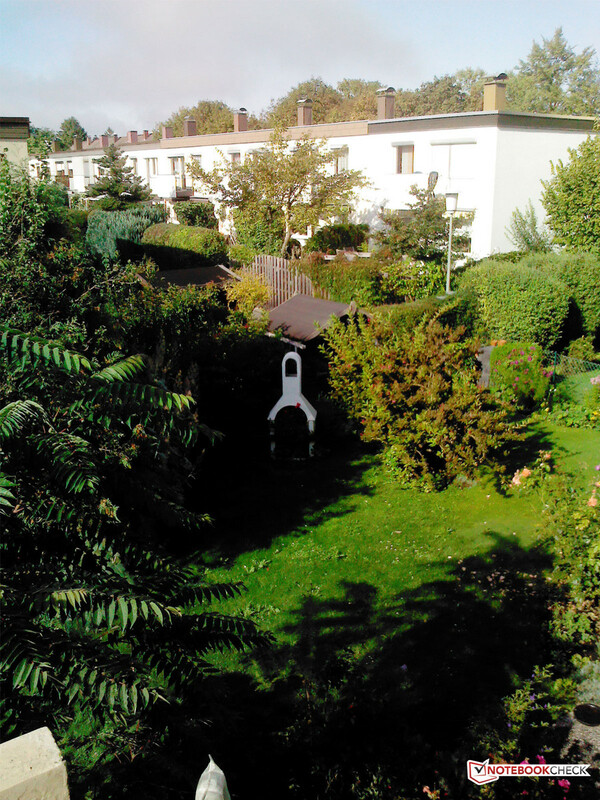 In the next test an H.264 video was played continuously at maximum screen brightness. All wireless, GPS and 3G connections were deactivated at this point. In this situation we measured a battery run-time of 7 hours and 3 minutes. 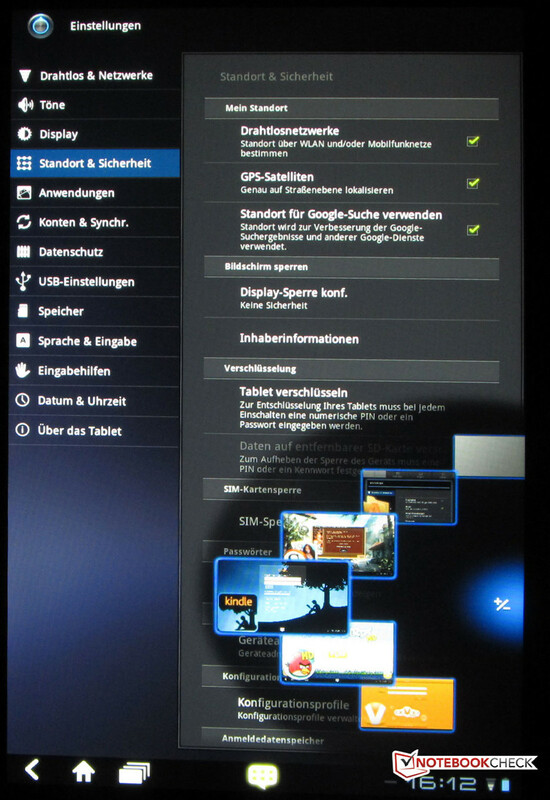 As a final test, the tablet didn’t have to do much at all: WLAN/ GPS/ 3G/ Bluetooth were deactivated, and the screen set to minimum brightness. In this mode the battery lasted for more than 14 hours. A maximum 14 hours of battery life, and then 24 hours plugged in to the mains to recharge? It is a mystery to us how Lenovo imagined this would work in practice. Lenovo’s new star in the tablet sky outshines the iPad 2 and friends. The Lenovo ThinkPad tablet is able to impress us in almost every respect, at least to begin with. It has a first-class, capacitive IPS display, lots of memory as well as wifi and 3G connectivity. Everything you would expect in a mobile device. The ThinkPad tablet represents a successful entry into the tablet world for Lenovo. At times it really makes the competition look old in terms of functionality, connectivity and price. 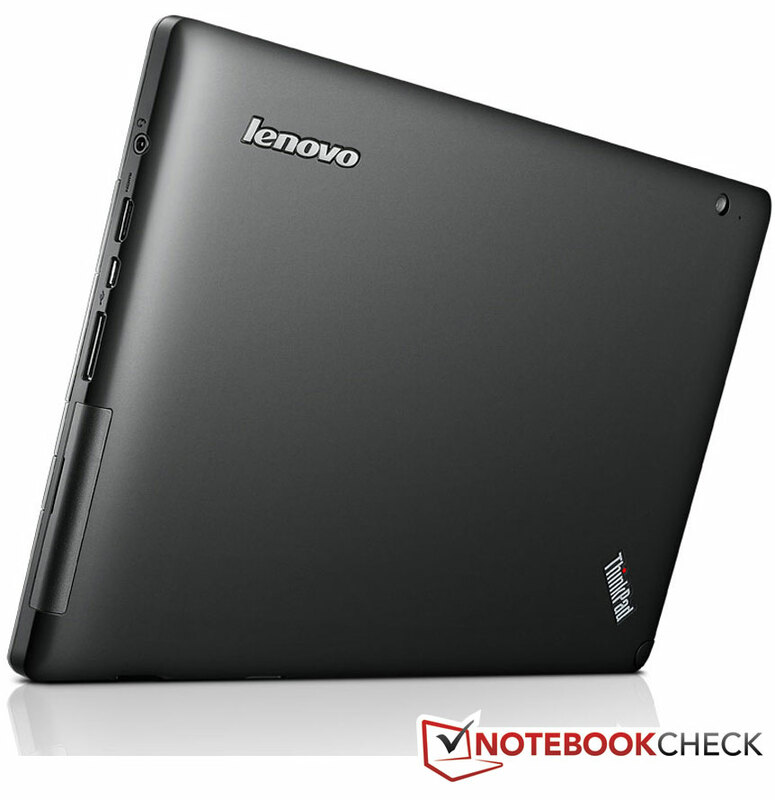 Whereas other tablets only offer 16 or 32 GB SSDs, Lenovo trumps this with 64 GB. Nor has Lenovo cut corners with the 10.1-inch display; the IPS panel used here is protected by Corning Gorilla Glass from impact, scratches and wear and tear, and significantly increases screen readability outdoors at the same time. 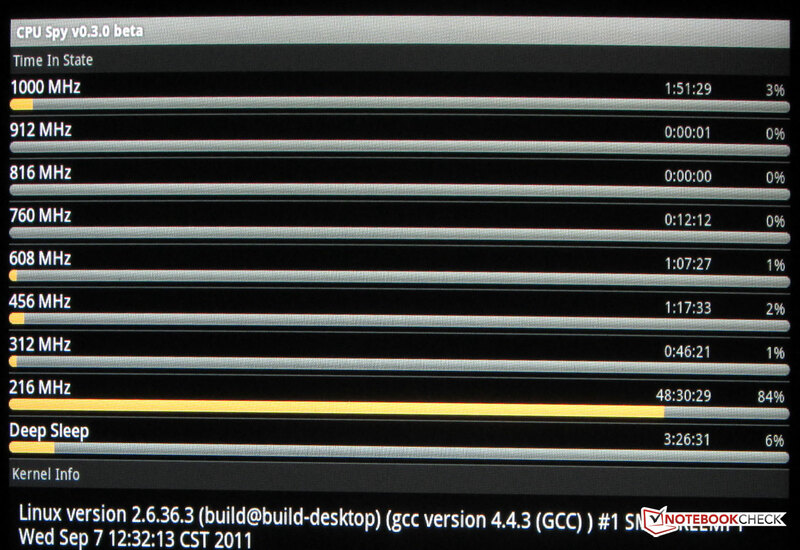 Inside the ThinkPad tablet is a 1 GHz Tegra 2 chip made by Nvidia, as in many other similar devices. The tablet’s performance is at the level you would expect. The major negative aspect that emerged from our testing was the battery, not in terms of its stamina - in fact the tablet was convincing once again in this respect - but in terms of the recharging cycle which is most definitely too long. The battery sometimes needed over 24 hours to recharge to 100% capacity, when using the charging adaptor supplied with the tablet. This has a significant negative impact on our rating of the battery. The current high-street price of the 64 GB model with wifi and 3G is 666 Euros. The ThinkPad tablet pen costs about 33 Euros in the Lenovo web shop. 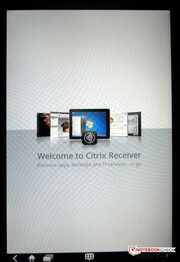 Screen with superimposed quick start menu. Settings for the quick start menu. 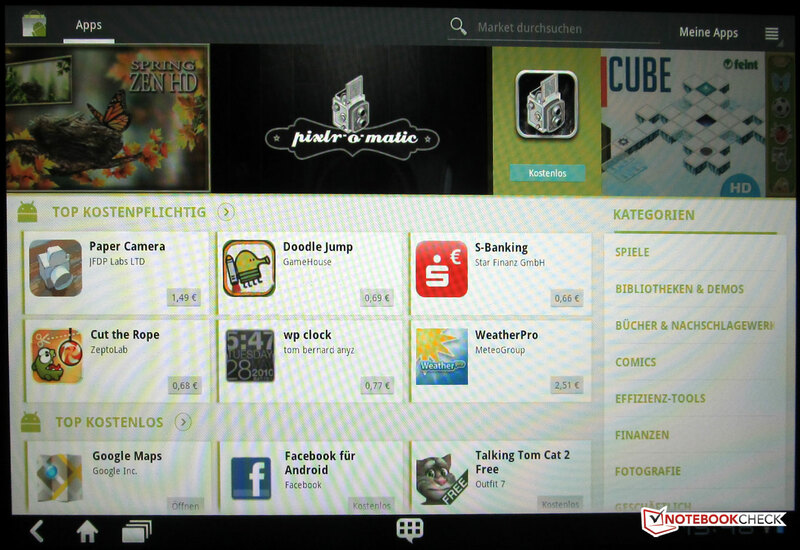 The button for the quick start menu can be used from inside every app. 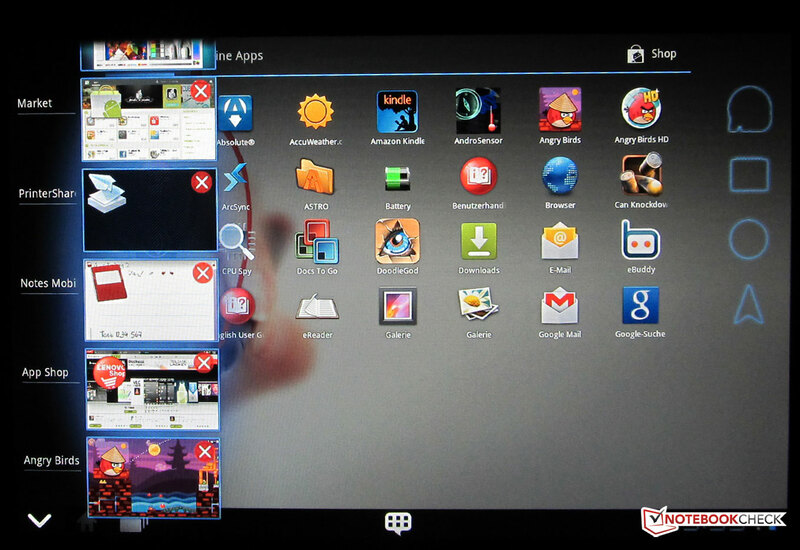 With the task manager (third icon) you can close applications that are still running. Back view of the tablet. 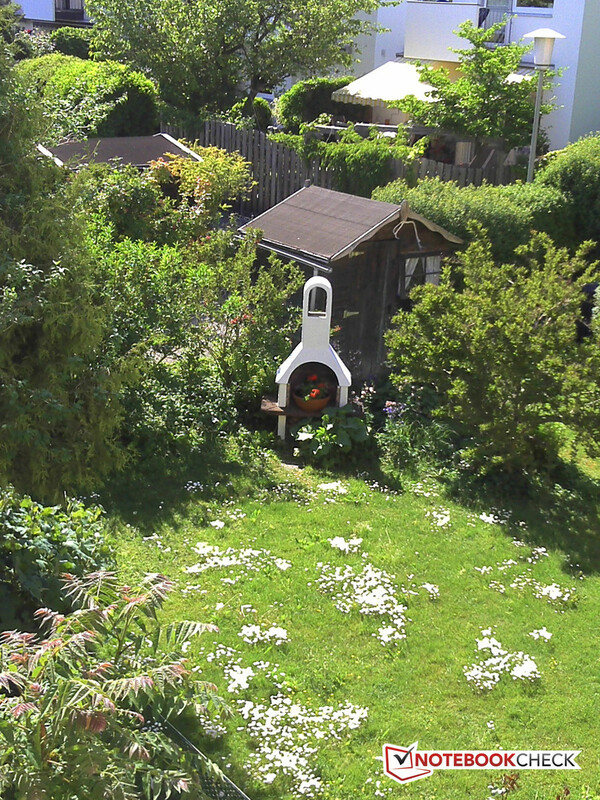 The 720p webcam sits on the top left of the front side. with four physical controls/ buttons. 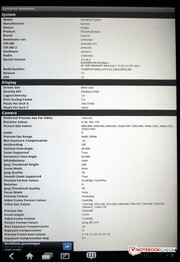 Back of the 10.1-inch tablet. 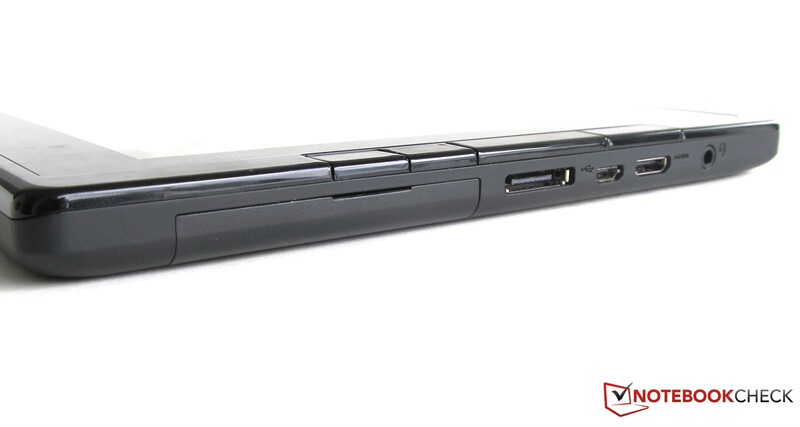 Lots of ports can be found on the ThinkPad. The USB host port can be covered up with a sliding door. And under this cover, the SIM and SD card slots are revealed. Volume is controlled using this rocker switch. Behind the red ‘dot’, the digitizer pen is hiding. The pen disappears completely into the tablet. 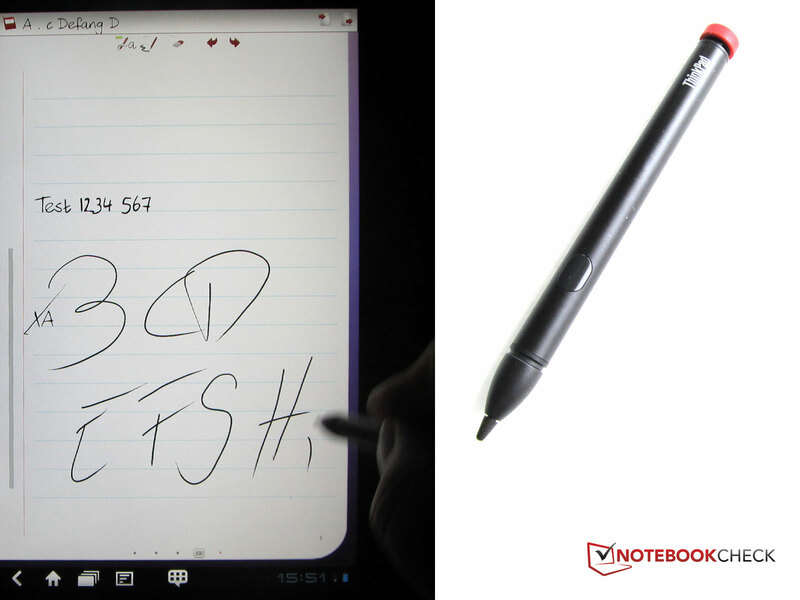 The Lenovo ThinkPad tablet’s digitizer pen. The package as a whole: display, performance, connectivity, functionality. A slightly more stable case wouldn’t go amiss. Also, a battery that charges more quickly, or the appropriate charging device provided with the tablet. The IPS display has very large viewing angles, vibrant colours and good contrast.